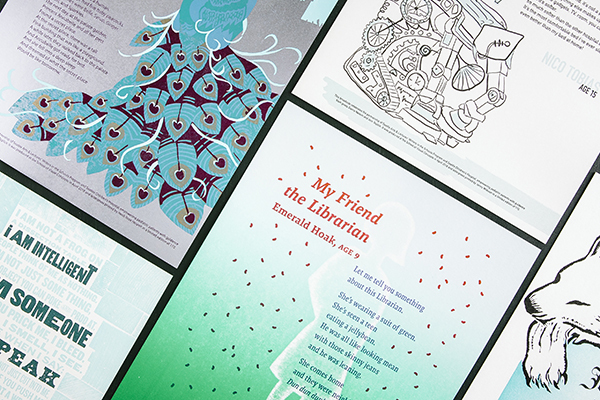 Part two in this year’s Broadside blog series highlights more of the beautiful art prints from the printers and writers who came together in the 2018 Seattle Children’s Hospital Broadsides project. 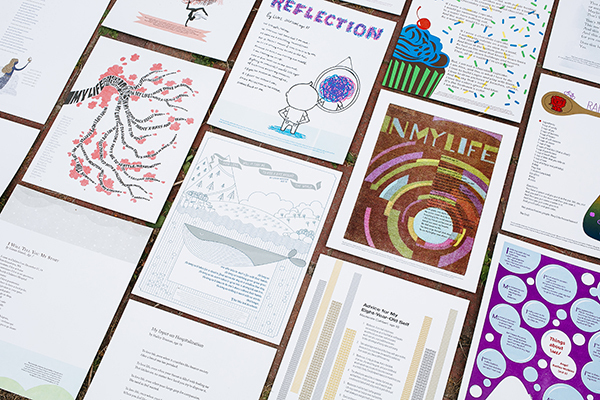 The Writers in the Schools program (WITS – a poetry program created by Sierra Nelson and Ann Teplick), the School of Visual Concepts, and long-term patients at Seattle Children’s Hospital all joined creative forces to produce original stories that come to life in beautifully crafts printed works. Sarah Kulfan reflects on this year’s printing experience of adding in fun & color to their special young writer’s words. 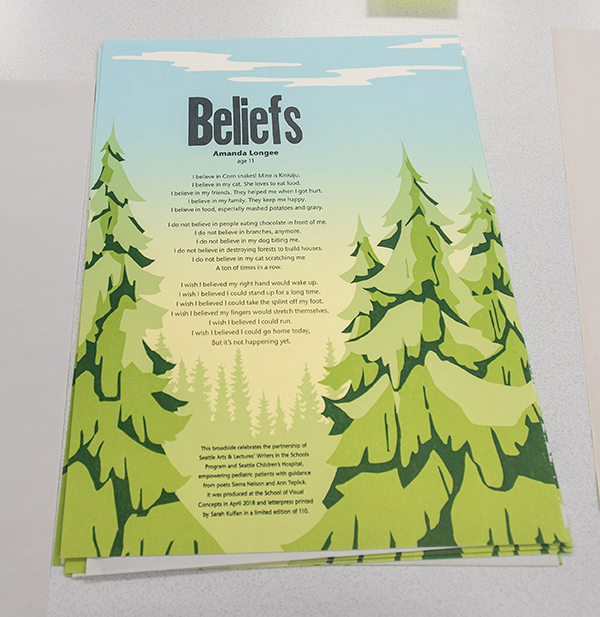 There are a couple of lines from the poem by Amanda Longees, Age 11, titled Beliefs, that inspire the forest and tree theme illustrations. 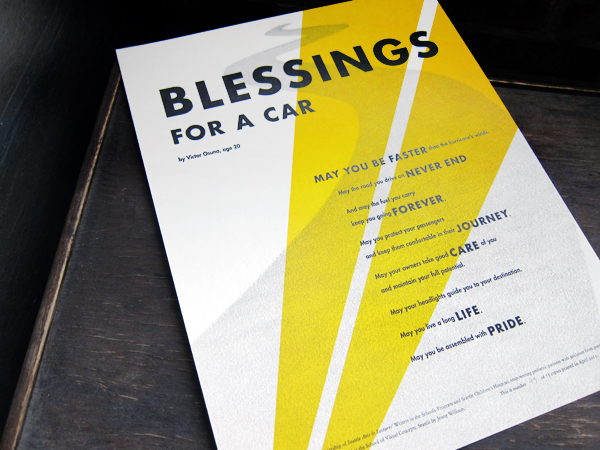 My goal was to create a broadside that was bright and optimistic. 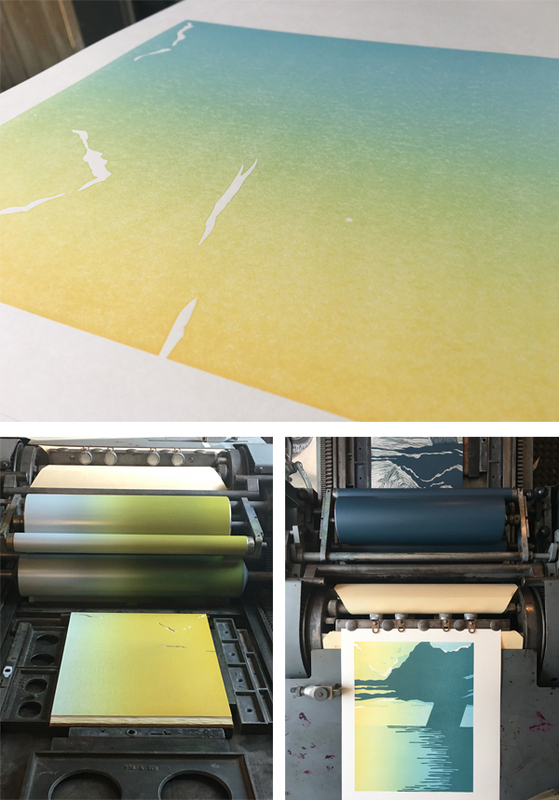 In the first print pass, I created a split fountain gradient that represents the rising morning sun. With a design perspective of looking out across the treetops, there is a sense of spiritual uplifting. Which also reflects the title of the poem. With the tree element design, it was only natural to include a wood type for the title. 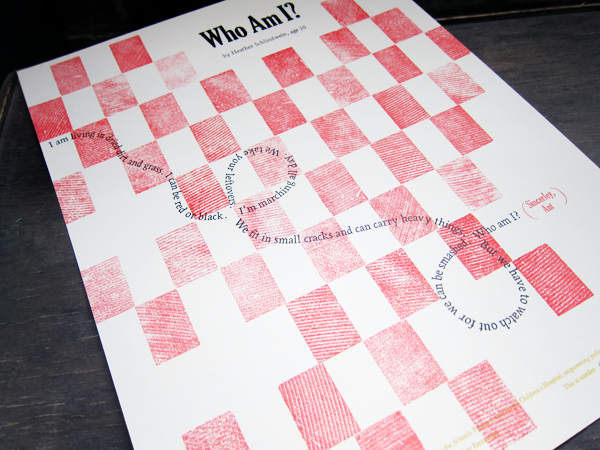 I worked with Boxcar Press to create plates for the poem and colophon. The reduction cut process includes a total of 4 colors. Each color is a successive layer that is carved from the same block. The colors typically go from light to dark. This year’s challenge for myself was to print a full bleed and a gradient on a portrait style broadside. Which includes several rounds of careful trimming, and maxing out my press’ sheet size in order to make that directional gradient work. The talent and commitment of our young poets and group of printers are impressive. It is an honor to be a part of this amazing collaboration effort. I am grateful for the support of business partners like Boxcar Press – who help fuel this creative endeavor from the beginning. 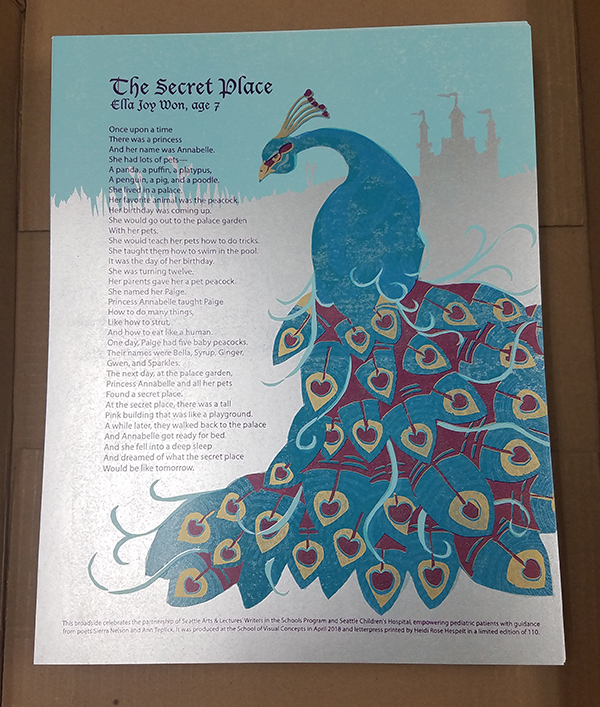 This year’s broadside design illustrates a poem written by Ella Joy Won, Age 7, titled The Secret Place. Ella is a “sparkly girl,” and the design reflects this through the incorporation of bright colors and metallic inks. 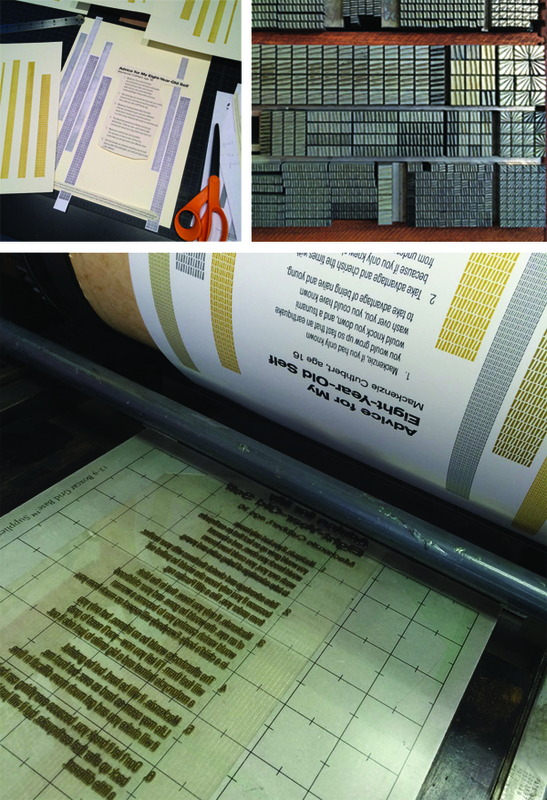 The printing of the poem starts with text which uses polymer plates from Boxcar Press. Next, is the artwork. This piece, in particular, there were 7 passes through the press. The press used a large reduction linoleum block that carves away sections of the block between each color pass. Next, printing the gold pass. Followed by mixing ink for the purple coloring for its pass. Finally, I will print the text and trim the paper. 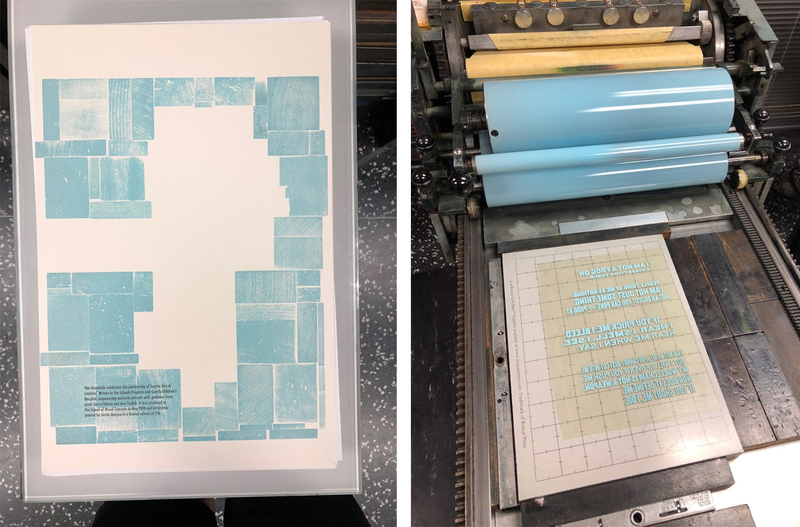 As a letterpress instructor at the School of Visual Concepts, it’s a real joy to see students evolve from fledgling ink slingers into skilled printers, and this Broadside project represents a milestone in that journey. There are many new names on this project’s list of printers this year, but by no means are they new to the press. This year the stars finally aligned for them to join this kind-hearted & generous group, raising the bar of talent even higher than before. 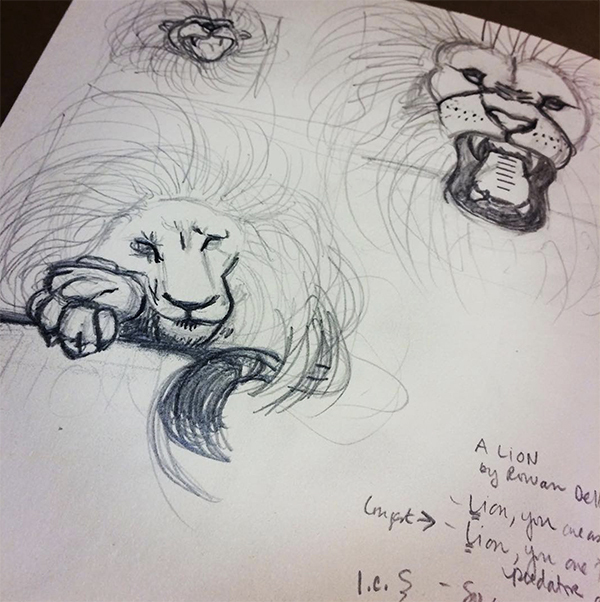 When first reading, A Lion by Rowan Delloway, Age 6, I was struck by how much power just a few words carry. Looking beyond the face value of his admiration of a lion, I interpret the lines “so you don’t run from anything / because no one can hurt you” as representing Rowan’s own fierce determination and strength. This concept was my guide through the design process to include bold elements and a careful use of color. It would be easy to show the lion’s power through a literal translation of Rowan’s words. However, after making some quick thumbnail sketches, I chose to illustrate it through a display of calm confidence. The lion may be at rest — claws in, tail curled around its body — but its one watchful eye says, “Think twice before you make your move.” I imagine it protecting Rowan, watching over him… ready to pounce and unleash that power upon any threat to his well-being. The first rough layout sketch was effortless. In contrast to how my process usually goes. When looking back at my choice to sketch on top of make-ready tells me I really didn’t expect that to happen. I wasn’t sure if I would be able to capture that energy if I redrew it again. Instead, I used a thick charcoal pencil to rework the sketch on top of the original. 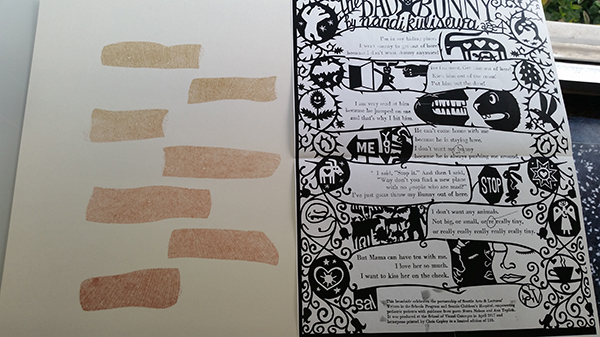 When I removed the tape that was masking my margins and lifted the page from the table, I got a kick out of seeing my make-ready for Zack Edge’s poem (from the 2016 portfolio). 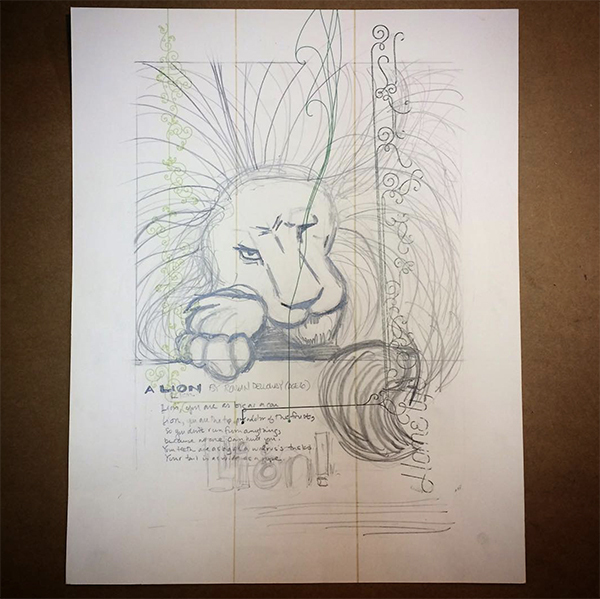 Moving on to typesetting, first I started with the easiest part: LION! Big and bold, the size alone limited my choices. Next, I selected a Latin wood type that when aligned to the right margin of my sketch. This left just enough room for the body text and colophon. Also, it also gave me the excuse to use the Latin Wide metal type in my collection. Typically, this is not a face I would normally choose for body text. Due to the short nature of the poem made it feels safe enough to try. I’m delighted that it worked! By this point, my typesetting was complete for the day even though the colophon wasn’t done. This is my 8th year contributing to the broadside project. And my first year contributing by carving an image from linoleum. 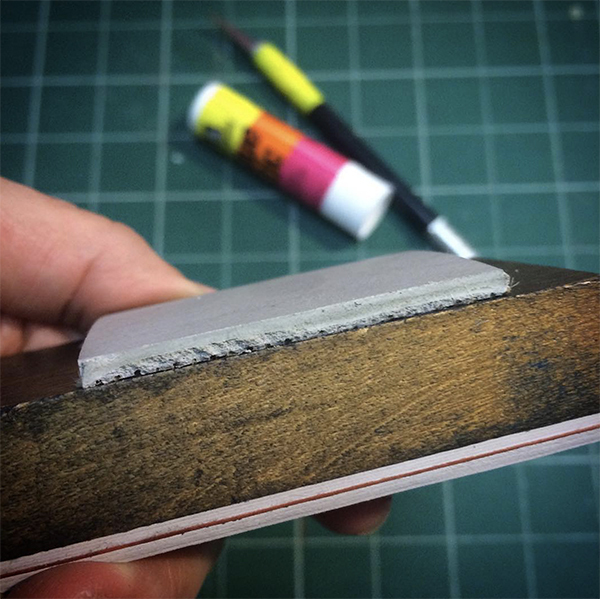 For those who are familiar with linoleum, it cuts the smoothest when warmed by the sun. Lucky for me, Seattle was having an unusually warm sunny spell in May. Time to move outside. I usually shy away from carving. However, I had a strong vision of a bold and graphic piece, that I went for it. For the first time in over 20 years, I invested in a new set of carving tools. I also made sure to purchase extra blocks, just in case of a few errors. Careful viewers can see, right out of the gate, I forgot to reverse my image before carving. On the second carving attempt, I decided to slow down and take a proof before moving forward with the paws and tail. The placement needed to be just right in order for the type to work. Refreshed by a new day, I also finished typesetting the colophon and proofed that as well. Out came the scissors and tape and Sharpies. Paw and tail position decided, the remainder of the lion carving went well with only a few minor slip-ups. The sun was having a positive effect on my outlook, and I decided I could live with a few wayward marks. 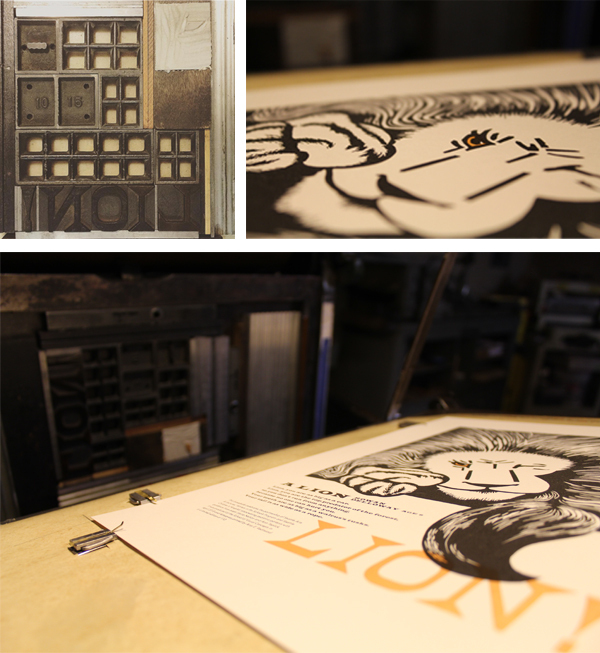 I moved back into the studio, locked it up, and printed the first run on my Colt’s Armory platen press. In a fit of stubborn efficiency, I decided to print the lion’s eye color with the last line of the poem (“LION!”), in one final pass of orange ink. To guarantee perfect alignment, I mounted a small rectangle of uncarved linoleum to a piece of furniture, made it type high, and composed it with the wood type. Taking measurements of the lockup from the text printed in black, I was able to lock up this new form in the exact location in needed to be. Without changing my page guides on the tympan, I then pulled a blind proof on a still-wet print from the second pass to confirm that the text aligned as I wanted. The black eye of the lion offset onto the uncarved linoleum, revealing exactly where I needed to carve. I added a little trapping as a safety measure, in case some of my earlier prints had shifted alignment in the run. 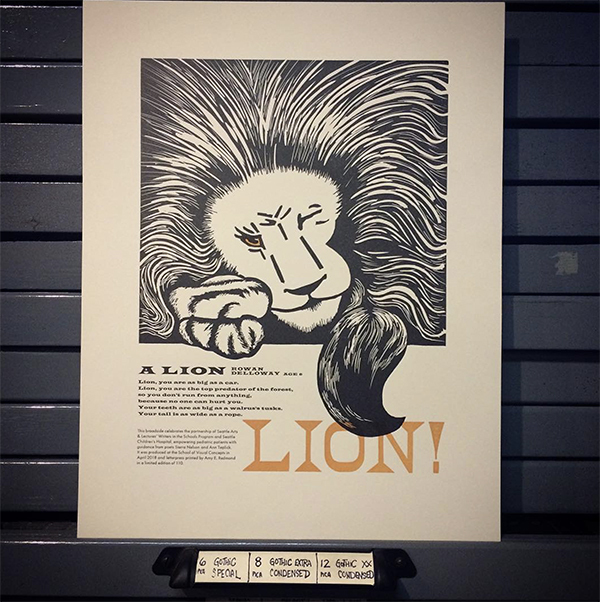 Come check out Part 1 of this year’s Children’s Broadsides project! We would like to thank all of our young writers, organizers, printers, and families who help make the 2018 Broadsides project memorable and powerful. 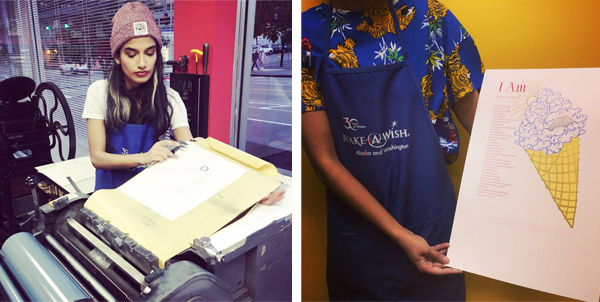 We enjoy giving back to the letterpress community and supporting amazing opportunities for printers around us to create, shine, enjoy, and share in the magic that is printing. 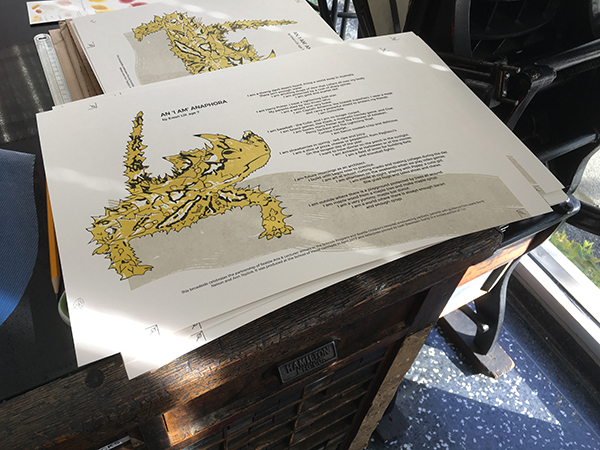 In its eighth year, Boxcar Press has had the honor of contributing photopolymer plates to the 2018 Seattle Children’s Hospital Broadside project. 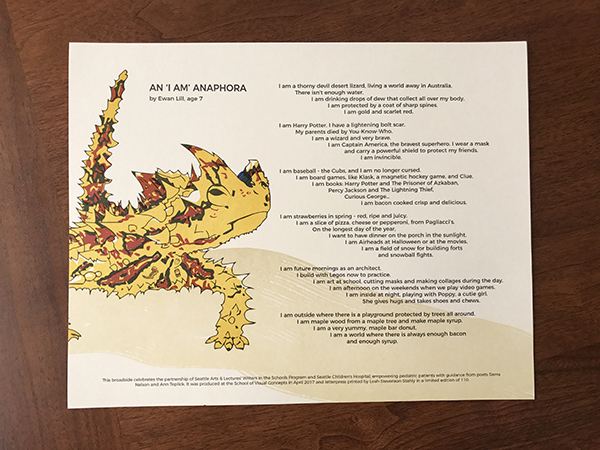 The culmination of combining the talents of Ann Teplic and Sierra Nelson of the Writers in the Schools program (WITS), the School of Visual Concepts in Seattle, and young local poets at the Seattle Children’s Hospital was 20 cleverly crafted broadsides. 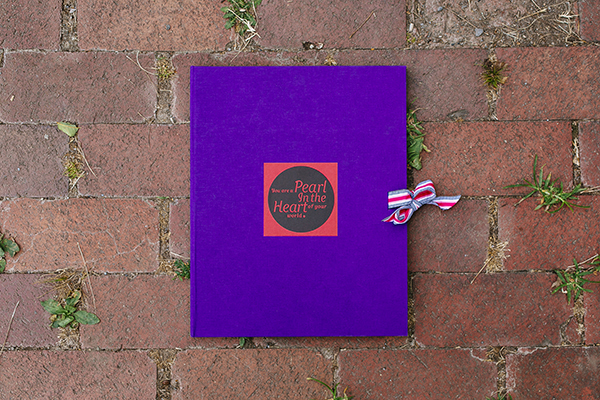 Each print had a limited run of 110 editions. This first installment of a two-part blog highlights four printers who share their heartwarming experience bringing their young poets words to life. 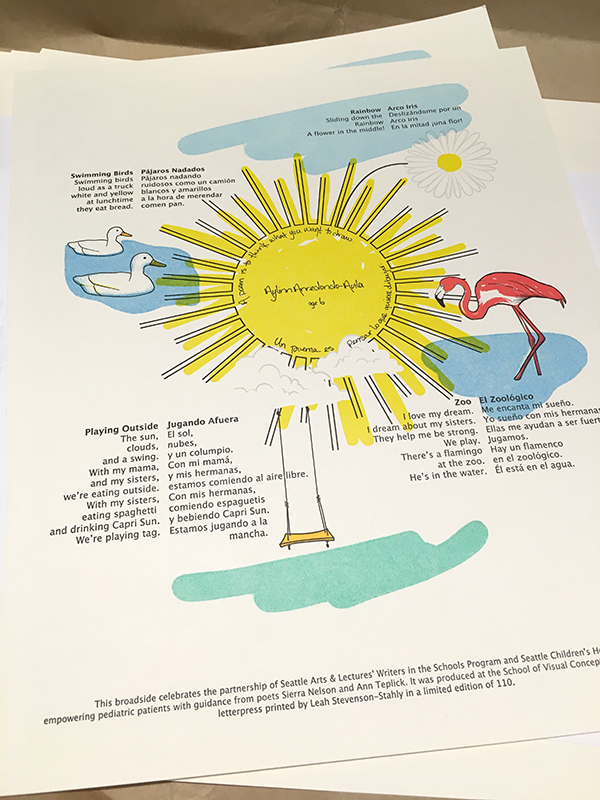 The process of working on the Children’s Hospital broadside project each year is a combination of dedication and commitment as well as skill and inspiration. Each year, children present to us a selection of poems before we come together as a group of printer/designers for the first meeting. At that gathering, the wonderful poets-in-residence who bring such heart to the project, Sierra and Ann, read each poem written by their young proteges. We have our preferential choices and usually end up with the poem we most wanted to work on…although that process may occasionally require some good-natured negotiating. It never feels like enough time to work on our broadside. Sometimes we receive helpful hints or information from the poet and/or their family. Sierra was able to connect me to the family of the delightful young girl who wrote about her grandmother’s dog and the times she spent with them. Her parents sent me some photographs of them with their daughter and she was happy, gay and playful in the photos. I wanted to convey that delight in the broadside so I carved a linoleum block of a young girl dancing and spinning and another block of a playful dog who (I hope) looked like the one her grandmother had. The type for the poem, title and colophon was a combination of handset type and ornaments from my own cases and Linotype set according to my specifications by my good friend and Linotype master in Los Angeles, Bill Berkuta. 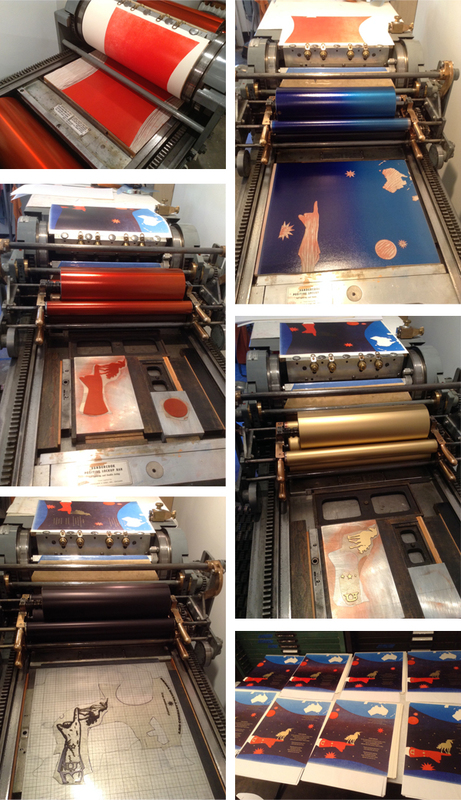 Each color is ran individually on the press. The sheets of paper went through my Vandercook SP15 and my Chandler & Price 10 x 15 a total of eight times. This was in order to avoid over-inking the type and/or under-inking the images. Because of the nature of this project, there is a great deal of poignancy with it. I learned that my young poet had already passed away by the time this year’s project had begun. While I was charmed by both the exuberance of her poem and her photographs, it was bittersweet to know that she couldn’t see herself in the final printed poem. When I first read Jesse’s poem, his words really stood out to me, and I wanted to put them front and center. 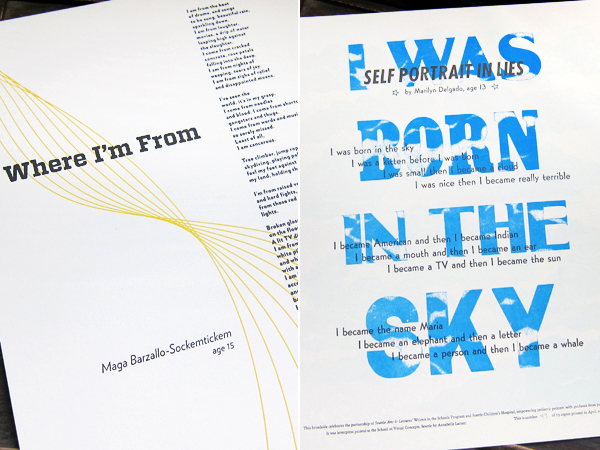 To achieve this, I used his poem to create a typographic portrait instead of calling out a specific image he evoked. I wanted to elevate his voice rather than creating my own interpretation of what he was saying. 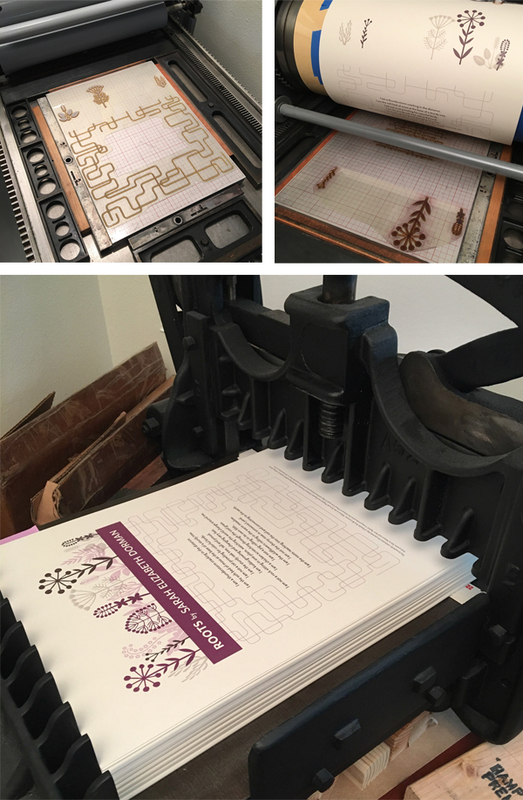 My broadside had a total of five passes on press using wood type, metal type, and photopolymer plates. I first handset and printed four lines of the poem that I wanted to emphasize in wood type. Scanning this type allowed me to arrange the text on top of a silhouette. 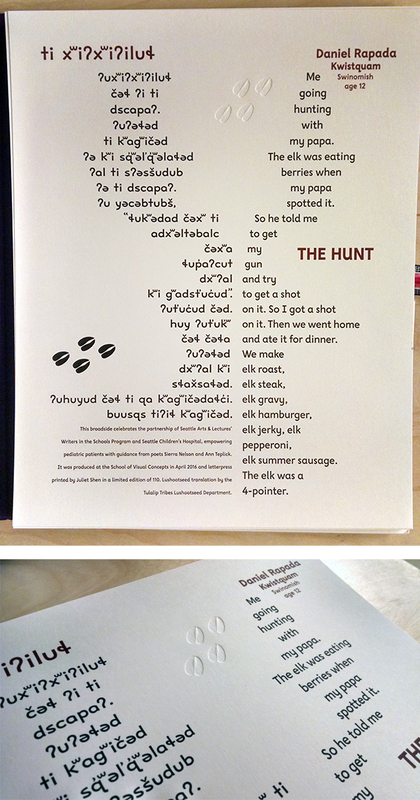 I set the rest of the poem digitally using HTF Knockout, HWT American, and HWT Catchwords. I resized and rearranged the scanned wood type and digital type until I was happy with the composition. 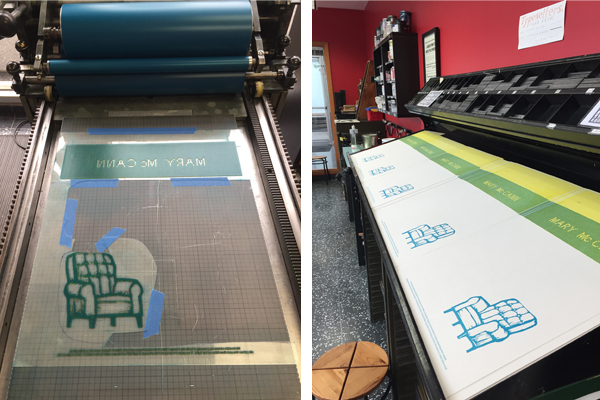 Back in SVC’s letterpress shop, I used a printout of my digital layout as a guide. I set it down on the composition table and set type on top of the paper. Using upside down wood type, I created a woodgrain texture around Jesse’s words to help create the form for the silhouette. I handset the type for colophon, byline, and title using metal and wood type. The woodgrain texture was my first pass on the press. I scanned one of the final prints of this first layer, made sure all of my digital text lined up properly, and then put in an order for my photopolymer plates. 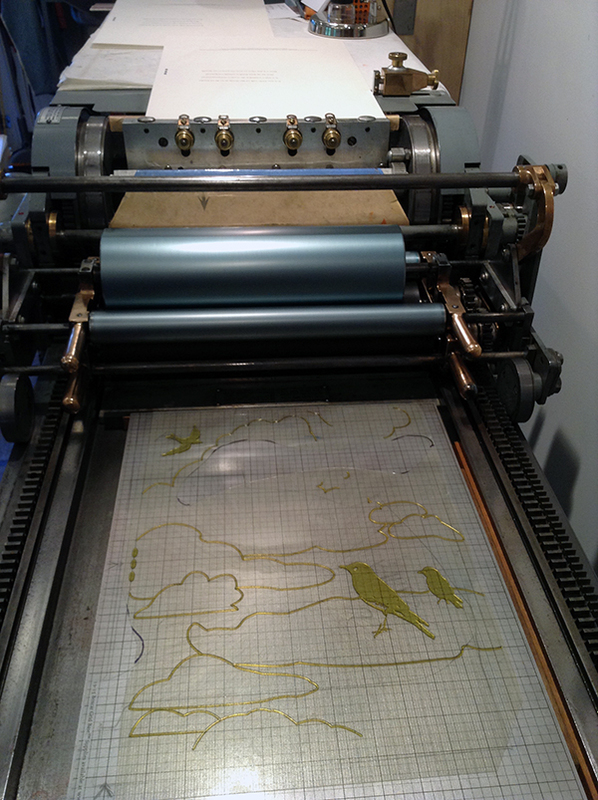 On press, I printed the handset colophon, followed by photopolymer plates for the light and dark blue layers. For the green layer, I used a smaller Boxcar base, so I could also print the handset title and byline at the same time as the green photopolymer plate. Unfortunately, I didn’t get a chance to talk with the young author for this project. I just hope that my broadside helped amplify Jesse’s voice. It was really fun to design a piece of artwork around his words, and it was an honor to be part of this year’s Seattle Children’s Hospital Broadside project. This year’s piece is all handset metal type and carved linoleum. In the past, I’d done elaborate pressure prints and layers. This year, I wanted to keep it simple and clear as I did not meet my poet. 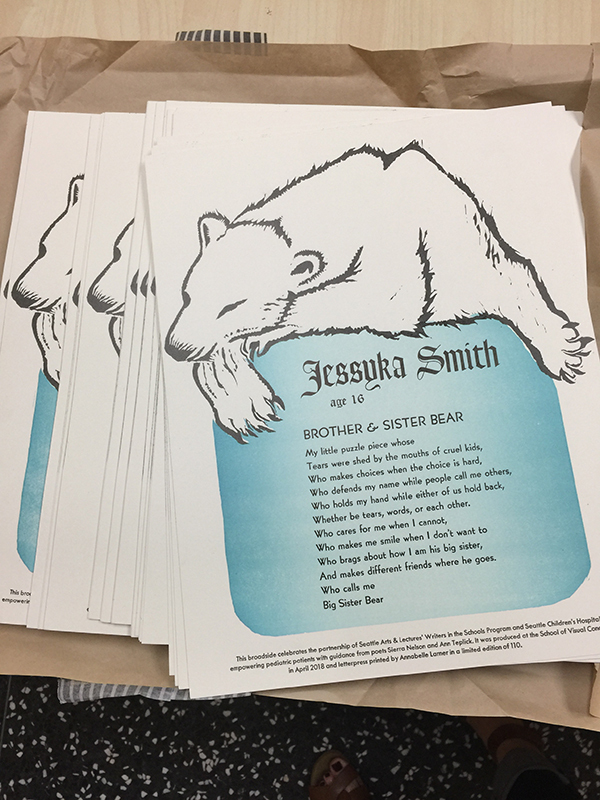 The poem is called Brother & Sister Bear, by poet Jessyka Smith, age 16. It’s about her little brother, and what a great support and defender of her he’s been in her life. He calls her Big Sister Bear. Jessyka’s poem made me think of a protective, strong, and fierce bear. 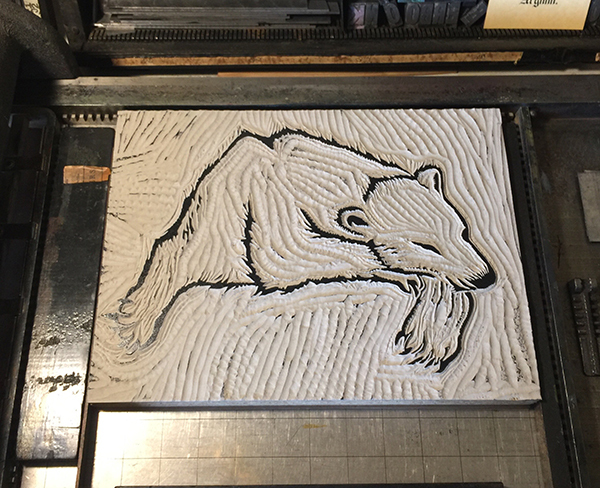 Using linoleum, I carved a big slumbering bear to lay across and frame her poem. It ended up looking like a polar bear. 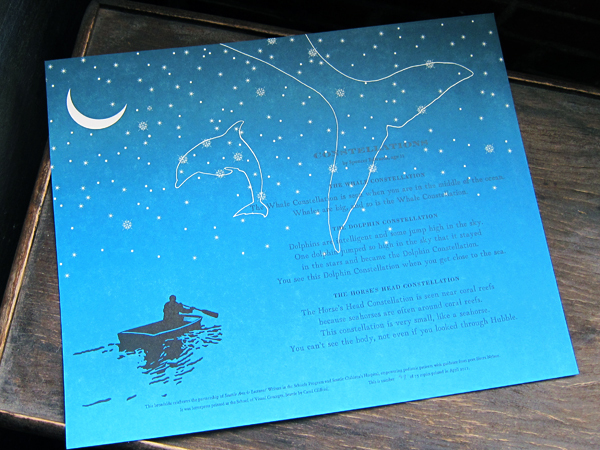 I thought it would be nice to have a cool, icy-blue area for the bear to rest on, which also added depth under the poem. This blue background was carved in linoleum as well. Regarding the type, I hand-set her name in big, 72 pt. Goudy Text to make it stand out. I also liked how the curves and lines of the typeface looked with the bear. I chose Bernhard Gothic for the poem itself, to contrast with the Goudy Text. Also, I loved the W’s in this typeface, since there were so many that started each stanza! And the Bernhard Gothic ampersand for the title was unique and pretty. 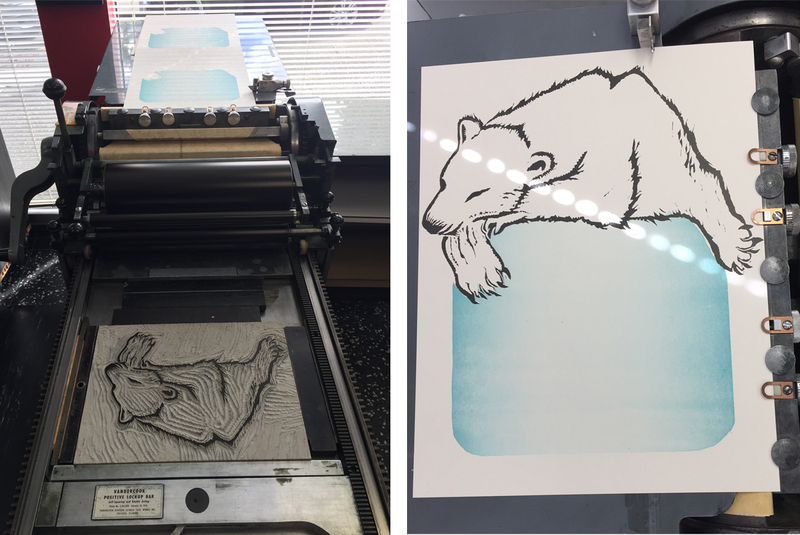 The first item that goes to print is the bear, which uses black ink. Second, is the blue background with a split fountain which contains blue on the outside bleeding to trans white on the inside. Finally, the poem and colophon go to print. 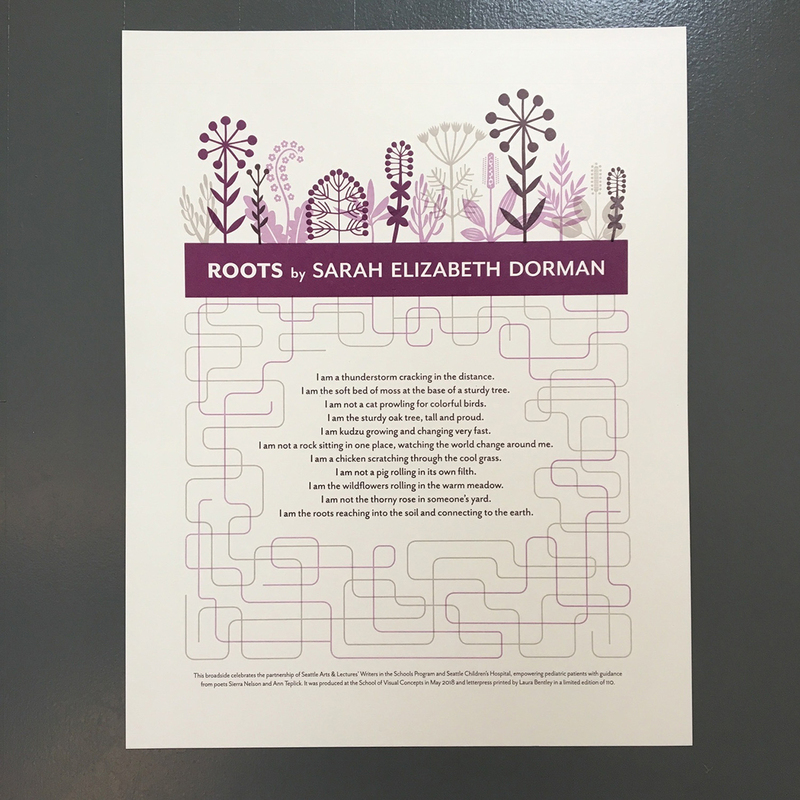 Sarah’s poem entitled “Roots” speaks to me because of the nature imagery. Specifically, the imagery of wildflowers and roots. I often print from handset type, but for this broadside, I decided to print from polymer plates. This allows for flexibility on choosing cohesive imagery for the wildflowers and the roots. The layout of the text was designed on a computer with digital fonts, of course. In addition, the foliage and flower imagery are also from a font! Really! The font is called Makalu and is a series of illustrations created by Juraj Chrastina. I felt like the playful feel of the illustrations. It fits Sarah’s imagination and her poem. The overlapping of colors to fill the top of the page was a natural fit. To evoke a mid-century modern feel, the roots are a tangle of geometric lines. Each of the four colors was printed separately. For an edition of 120, I started with 130 pieces of paper. For all of you counting this means I am feeding paper through the press 520 times! Stay tuned for Part 2 of our blog article series featuring more printers and their original and inspired prints. Part two in this year’s inspiring blog feature of the Seattle Children’s Hospital Broadsides project explores the work of five more clever printers and their young poets as part of the collaborative effort between the Writers in the Schools program (WITS – a poetry program spearheaded by Sierra Nelson and Ann Teplick), long term patients at Seattle Children’s Hospital, and the School of Visual Concepts. 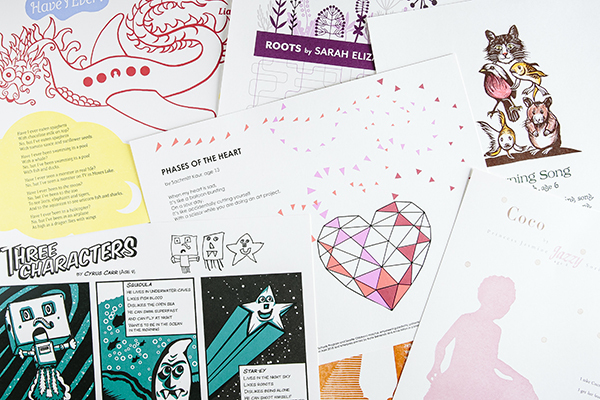 These five printers share with us how they brought to life the young poets’ colorful imagination in a cornucopia of color, text, texture, and fun imagery. 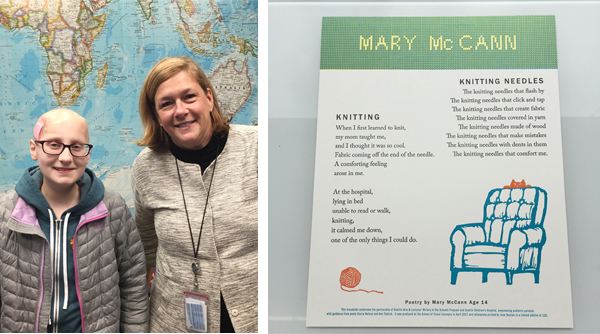 Jane Suchan While at Seattle Children’s Hospital, 14 year old Mary McCann learned to knit and wrote the two poems used for her broadside. I was drawn to Mary’s poems because of their emotion and imagery. I work at Seattle Children’s, so I had the good fortune to visit and get to know Mary a bit. As Mary and I were chatting she gave me some great design input: her favorite colors, the fun to be had with a ball of yarn, the sense of coziness and comfort she feels from sitting quietly and knitting. Mary is creative, energetic and playful, so I sought to reflect those characteristics in my design. Since we both have orange cats, and cats and knitting just naturally go together, I knew I wanted to include a cat somehow as our shared secret. The big, cushy arm chair and a playful cat ready to pounce on a ball of yarn tells a little story to go along with Mary’s poems. This line in Mary’s poem “Fabric coming off the end of the needle” made me think of knitted sweaters with intarsia motifs, so that’s where I got the idea to create a stockinette pattern with Mary’s name. 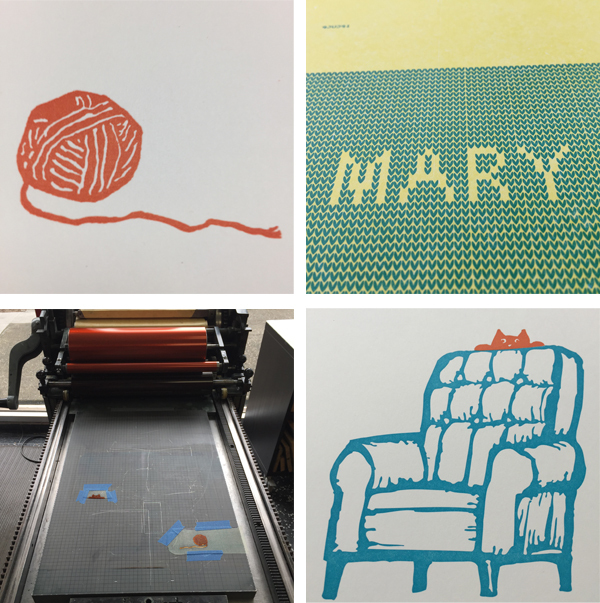 I printed in yellow behind the stockinette to create a fifth, blended color as a nod to Mary’s love of color. Mary’s vision is impaired, so I kept images simple, used easy to read fonts in a larger size and high contrast colors. My goal was to honor Mary and her poetry, to produce a keepsake that she would love and her family and friends would cherish. 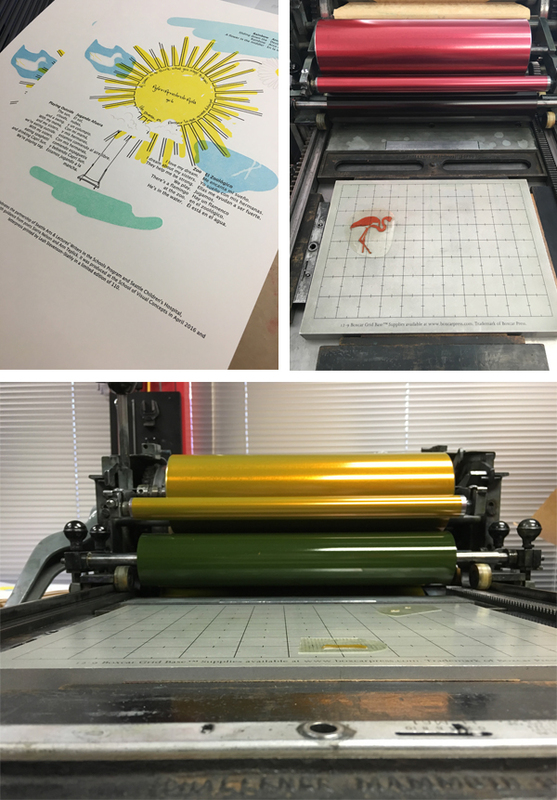 These broadsides were printed on a Vandercook SP15 press at the School of Visual Concepts over three days. In my first pass I used a large Boxcar base to print a block of soft yellow that would become the background for Mary’s name across the top of the broadside. 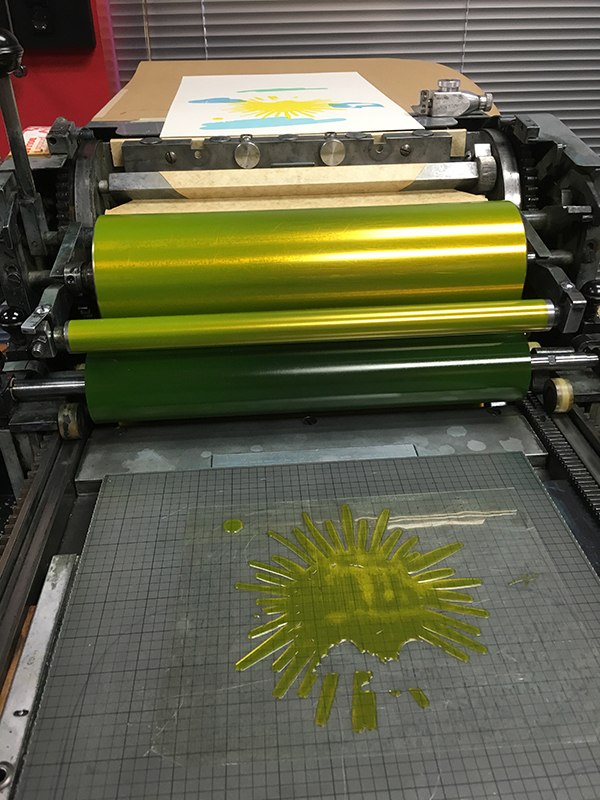 Printing the yellow behind the teal was an easy way to get a fifth color out of four passes on press. I had photopolymer plates made for the rest of the design elements, and pass number two was a run of teal for the chair, Mary’s name and the colophon. Pass three was the orange cat and ball of yarn, followed by a fourth pass in dark charcoal for the poems. The only tricky thing about my design was the tight registration of the orange cat and the back of the teal chair. I had the photopolymer plate made with the cat and chair positioned together as they would be when printed even though I knew they would be in two different colors. Before printing the chair I used an Exacto knife to carefully cut away the photopolymer plate for the cat and set it aside, along with the plate for the ball of yarn. After printing the chair, I left the photopolymer plate adhered to the Boxcar base in the press bed. I cleaned the teal ink off and added the photopolymer plate for the cat and yarn onto the base. 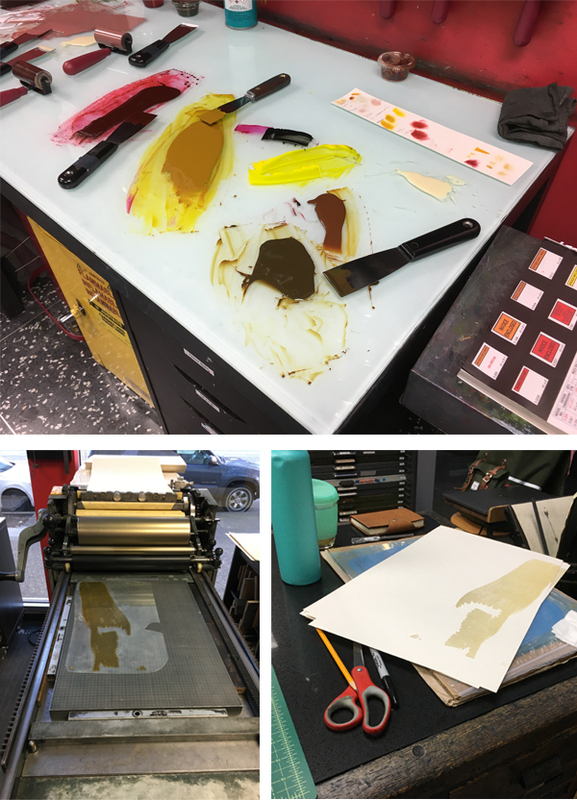 I pulled away the photopolymer plate used for the chair and other teal elements, re-inked the press with bright orange and was ready to roll in no time. 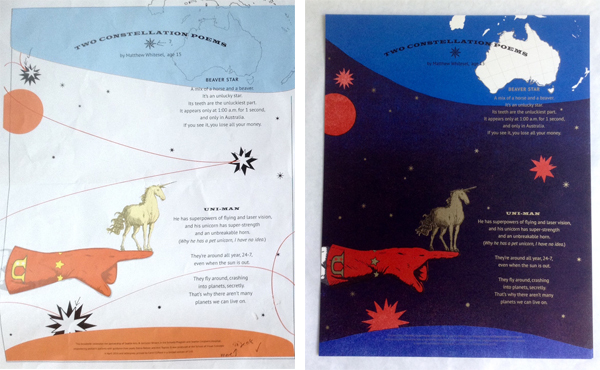 Jenny Wilkson This year, Jules Remedios Faye and I collaborated on one poetry broadside. 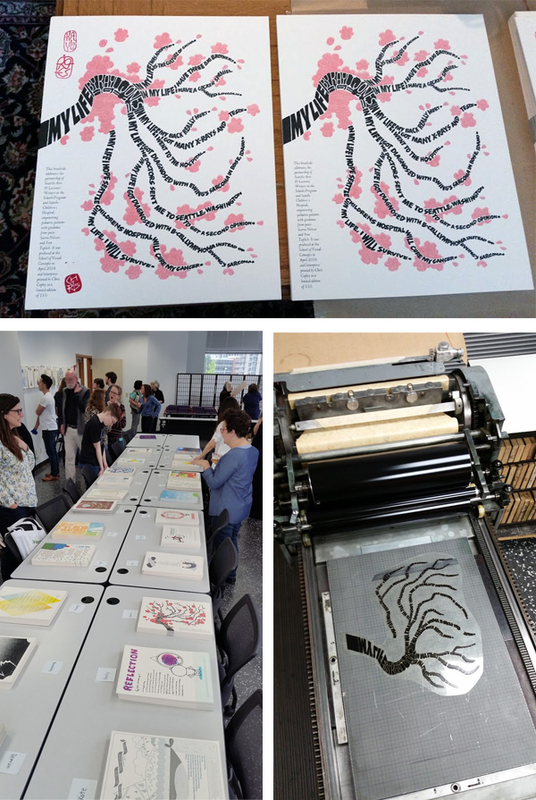 There were three letterpress processes we were excited to use: photopolymer for the text, because our chosen poem was the longest of the bunch; laser cut imagery, just because lasers are great, and collographs for detail in the illustration, which is Jules’ specialty. First, we double-hit a solid with straight rubine red, to achieve a saturated dark pink background. After it dried, we overprinted purple laser cut butterflies, being careful to add cobalt drier to the ink so that it would dry on top of the pink pass. Jules created a collograph for the light purple detail in the butterfly wings by gluing lace and sealing it with acrylic gel medium on an identical laser cut block, making registration a cinch. Finally, the gold text was printed using Boxcar plates. 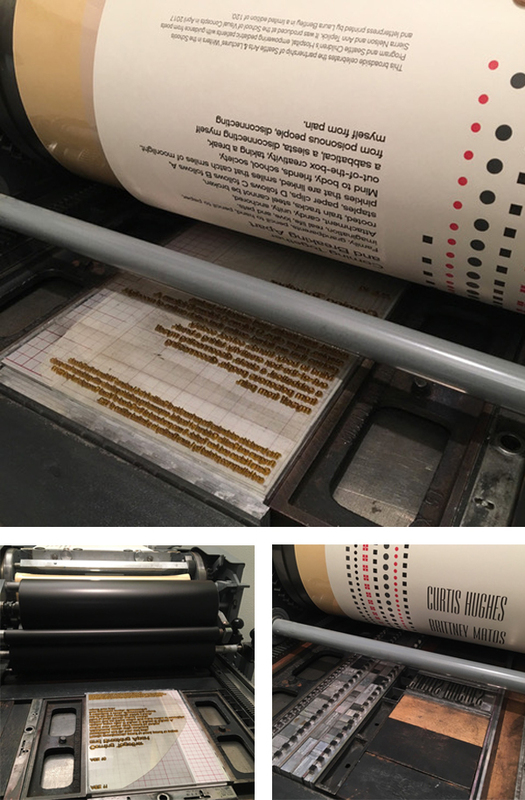 Laura Bentley The broadside is a three color design printed with handset metal type ornaments, metal type, and photopolymer plates. 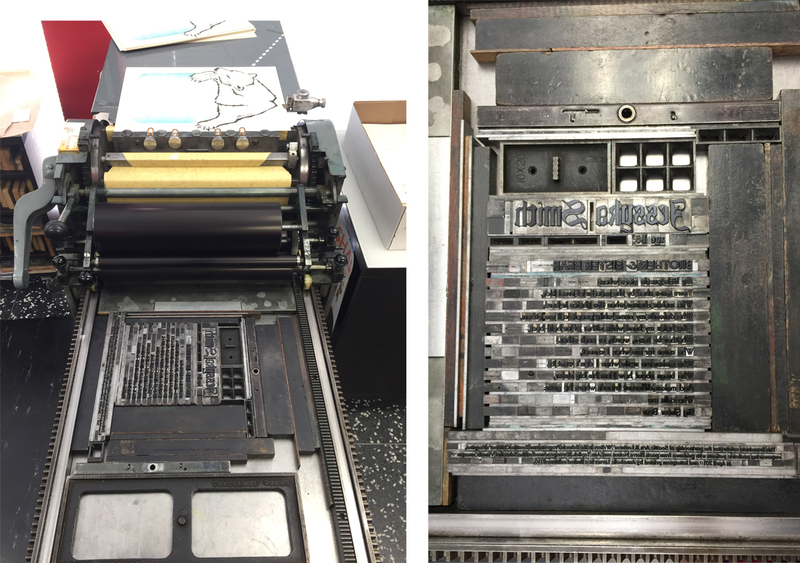 Type was set and printed on a Vandercook SP-15 printing press from the 1960s. The ornaments were arranged dripping down the page with the spacing growing such that the ornaments were breaking apart in a nod to the poem’s title. Simple shapes in dramatic colors echo the everyday and extraordinary experiences mentioned in the poem. 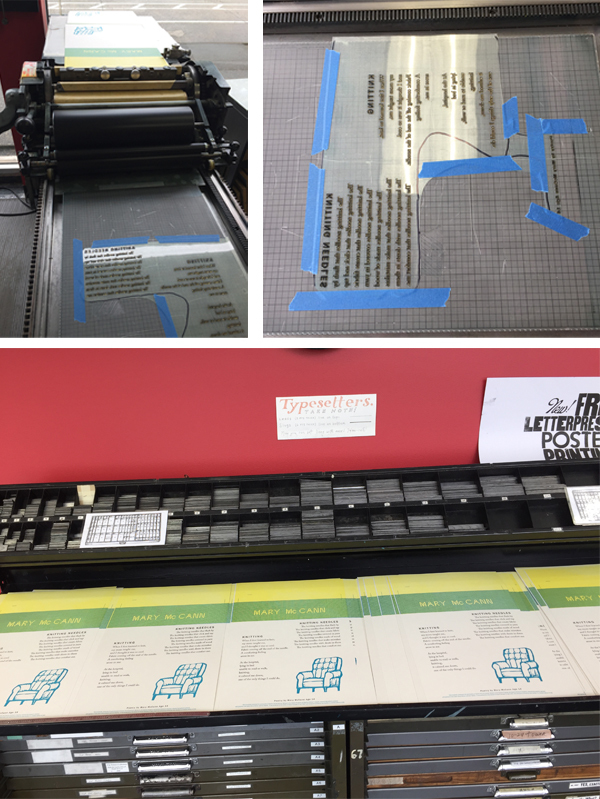 The poem text and colophon was printed in a fourth pass on the same press with photopolymer plates and a metal base from Boxcar Press. I didn’t get a chance to talk with either of the young authors this time. Sometimes with all that’s going on it isn’t possible. But I enjoyed learning about their experiences through their words. Poet Ann Teplick works with patients in this classroom and helps the students express their experiences through poetry. While I have a good variety of metal type ornaments to print with, and found a great font to use for the author’s names, my metal type collection came up short when it came to typesetting the poem text and colophon. Using a photopolymer plate opened up the possibility to print any typeface available on the computer, but for this design I chose a digital version of a typeface (Venus) from the age of printing with metal. While I have a couple of metal fonts of Venus, none were appropriate sizes. I like that Boxcar can fill in gaps in my metal type collection! Leah Stevenson As I was thinking about my poem for this year’s Broadside project, I was instantly inspired by the recurring presence of red and yellow/gold. I was also struck by how much more space was devoted to the thorny devil desert lizard compared to anything else Ewan wrote about in his poem. Because of that, I really wanted to have that be a focal point of this piece. Toward the beginning of my process I received an email with some scans of drawings Ewan had done. They represented what he saw in his mind as he wrote and read his poem so I really wanted to find a way to incorporate them. While beautiful, I was a little stuck on how to use the drawings I had received from Ewan while remaining true to my own style. I ended up just starting to draw a desert lizard to see where it would take me. Eventually, I realized I could use Ewan’s drawings as little ‘tattoos’ on the lizard. 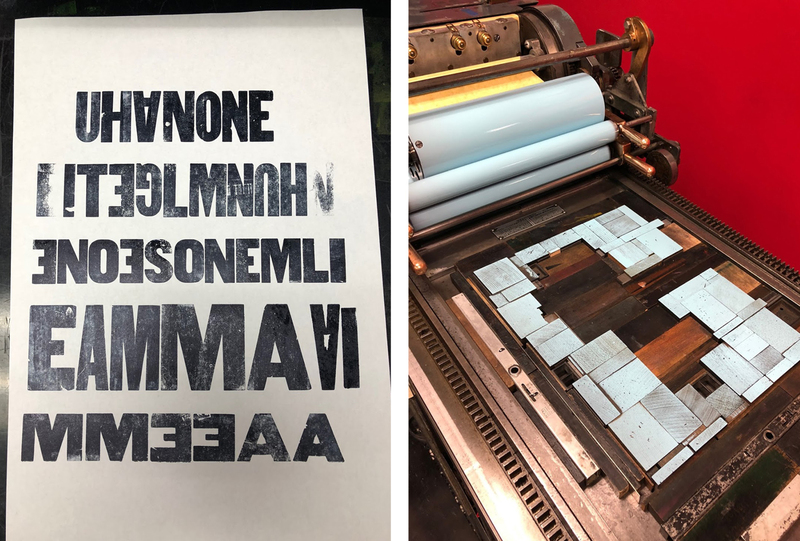 One of my favorite things about doing letterpress printing is combining my experience in digital design with the analog system of printing by hand. I was able to design the broadside digitally and used those designs to get photopolymer plates made. 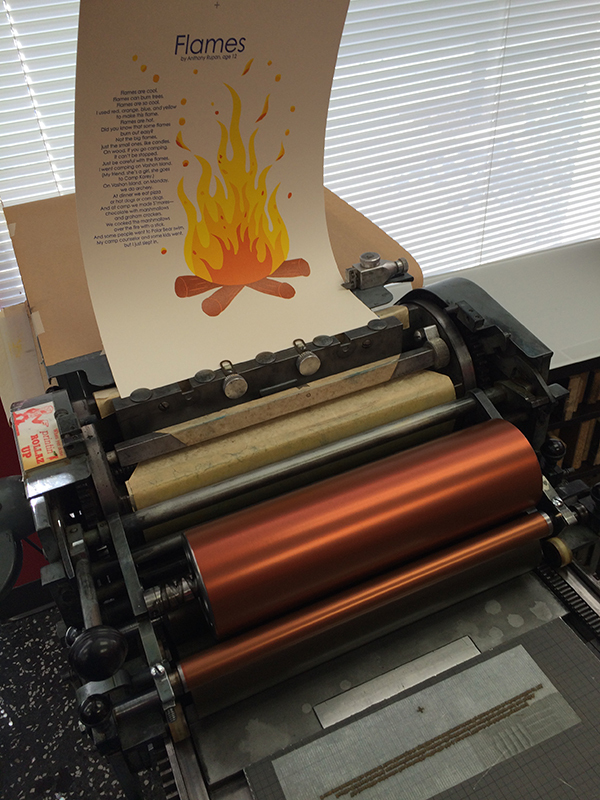 I printed the whole piece on a Vandercook SP15 press in SVC’s letterpress studio. I ended up with four passes through the press. I had actually planned a fifth pass (a blue for the baseball cap to bring in the Cubs in stanza three), but was on the fence about how much it really added. Once I pulled a proof of it, I decided it wasn’t necessary and left it out, giving me some extra time for paper cutting and sorting. Unfortunately, I was not able to meet with my author this year but I did get a little insight into his mind when I received the drawings he had made for the poem. I really loved having that extra bit of my poet’s creativity and imagination that I could incorporate into the broadside. It was fun to get a glimpse into his mind and see what he had envisioned when he was writing the poem and use that as another place to take my design. Carol Clifford For this annual project I usually work with the assumption that the young poet will see the finished piece I created for them, and in the past my hope has been to create an image for them to grow up with. This year’s piece was different though because I learned during the poem pick meeting that sadly Julissa had passed away. Knowing this influenced the feeling I wanted to convey. I didn’t want to make something too frivolous or silly. I usually don’t, but felt particularly aware of that this time. Plus, Julissa’s poem was serious and reflective, so I wanted to honor that as well as create a piece that felt more reverent. Initially, I had planned to combine several techniques: pressure printing, hand-set type, collagraphs, and linoleum cuts. However, I decided I didn’t want the “chatter” from pressure printing which is often a result. Nor did I want the heavier lines from linoleum cuts. I chose instead to use all polymer plates. In part for simplicity, but moreover for the clearer lines and shapes that I felt suited this poem. My hope for Julissa’s family is that I created a piece that is quiet yet witnesses her questions. I, too, would like to believe that birds walk on the clouds. Immense round of applause and thanks to all of the wonderful printers who donated their time and efforts to this truly beautiful project! 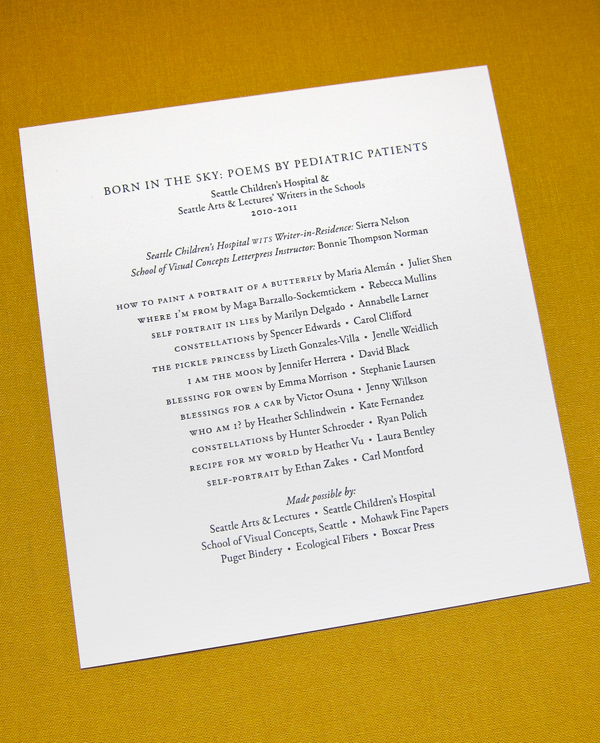 For its seventh year running, Boxcar Press has the immense pleasure of supporting the magical outcome created by this year’s 2017 Seattle Children’s Hospital Broadside project. 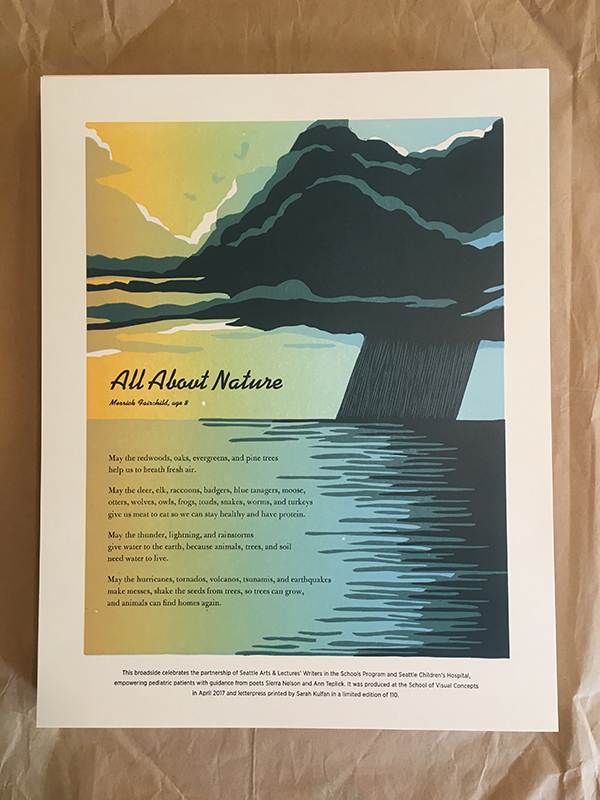 Guided by Sierra Nelson and Ann Teplick of the Writers in the Schools program (WITS) and the School of Visual Concepts in Seattle, an inspiring group of young poets and artist/printers collaborated together to produce 21 broadsides in a limited run of 110 broadsides. 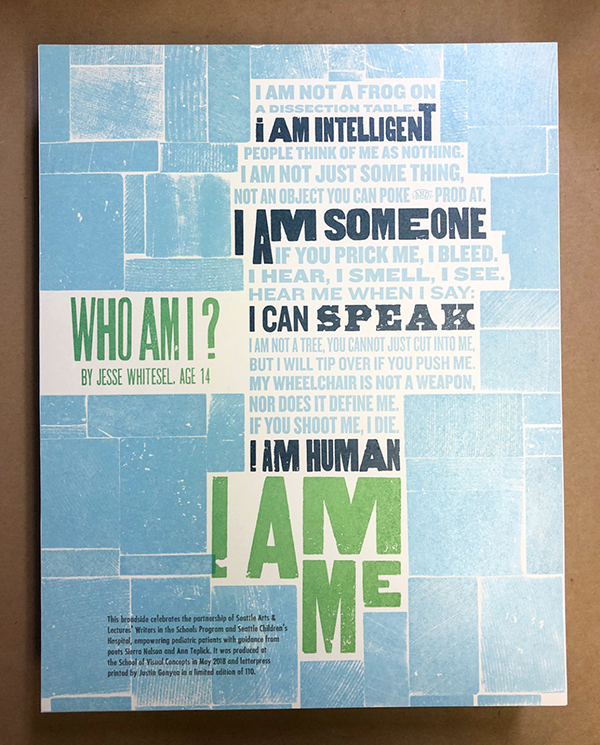 WITS worked with big-hearted printers as well as long term patients at the Seattle Children’s Hospital in this exceptional opportunity for fun, creativity, and stirring works of art. 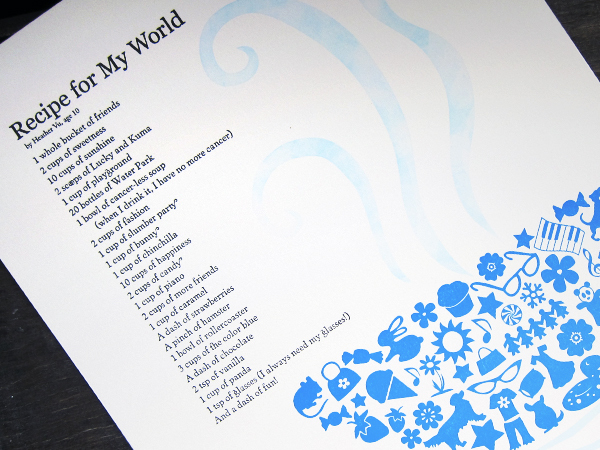 This first installment of a two part blog showcases four printers who share their creative printing process and capture the wonder of the children’s writing. 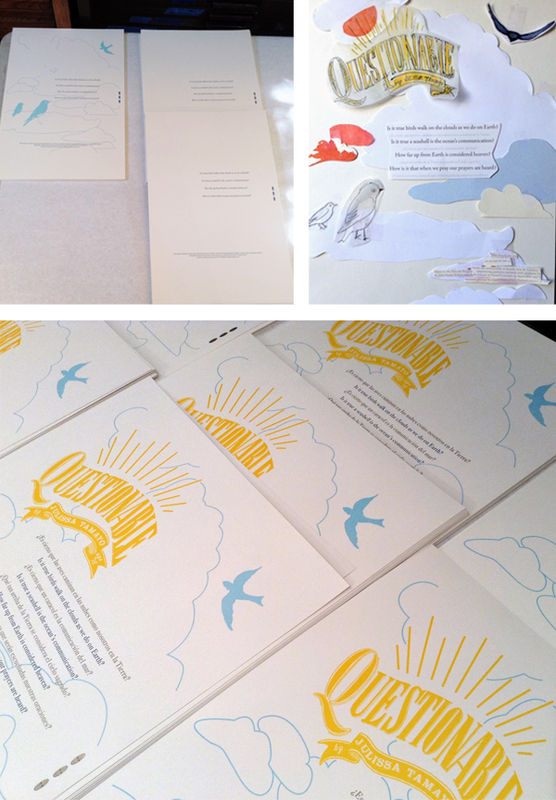 Sarah Kulfan I was very excited to print Merrick’s poem for this year’s Seattle Children’s Hospital Broadside project. As someone who spends a lot of time outdoors, his colorful descriptions of the natural world resonated with me and provided a rich trove of inspiring imagery that would pair well with his words. 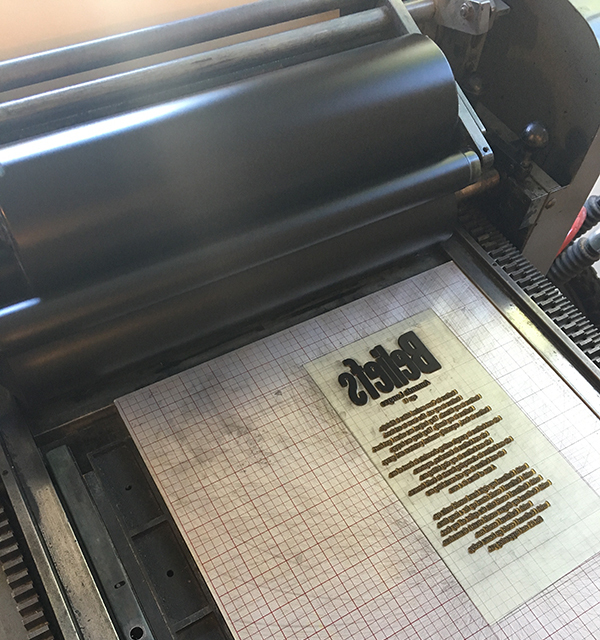 I printed a total of 6 passes on a Universal I, combining a linoleum block, metal type, and a Boxcar plate. This was my fifth year printing for this lovely project which brings together so many talented and generous folk. I was immediately drawn to Merrick’s poem. His words remind me of all the many blessings that nature provides, discoveries that I have found in my own wanderings outside. I haven’t met Merrick yet, but I hope to get a chance so that we can compare our adventures in nature. This year, I wanted to try my hand at a reduction cut that would combine split fountain layers. Using high-drama imagery of a hurricane worked really well for this process as it provided a big-sky, full frame backdrop. The poem speaks to the cycles of nature and the process of destruction and darkness followed by light and new life. The gradients capture the weather transition from light to dark and the reduction cut allowed me to build up the dark layers of the passing storm clouds. There were four total passes on the reduction cut and these included two split fountains. I printed a fifth layer of metal type for the poem. 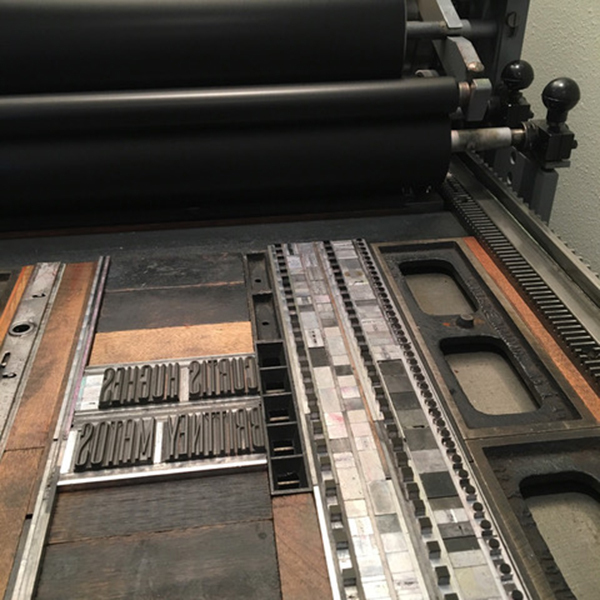 The final pass was the colophon text, printed from a Boxcar photopolymer plate, which saved a lot of time hand setting and proofing tiny type. Chris Copley Each year, I find myself wanting to push my artistic envelope in the Children’s Hospital Poetry Broadside Project — exploring a technique or concept while still making a piece of art that might appeal to people who know nothing of me or the poet or the project. I also try to reflect the feeling or personality of my poet. Nandi, my poet this year, was not quite 5 when she wrote her piece about a huge stuffed animal that fell on her while she was in her hospital bed. 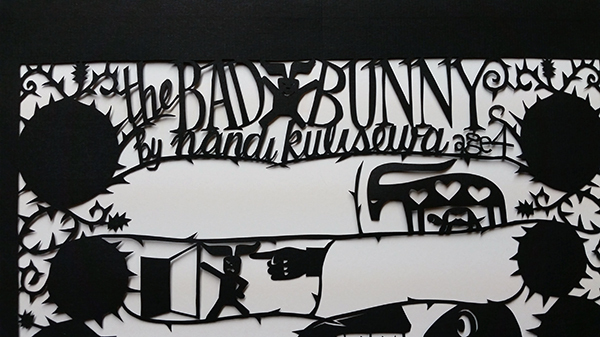 The poem features strong emotions, and moves from upset and angry (at the big bunny) to loving and heartfelt (toward her mom). I tried to bring that out in the frame around the poem. I also embedded folk-art-style drawings of animals and a few “easter eggs” in the frame, just for fun. I drew the original art on black paper, then cut it out with an Xacto knife. I scanned the cut-paper art and ordered a polymer plate from Boxcar; this was my third (and fourth) pass. The first two passes involved the technique I wanted to explore — perpendicular split fountain printing. 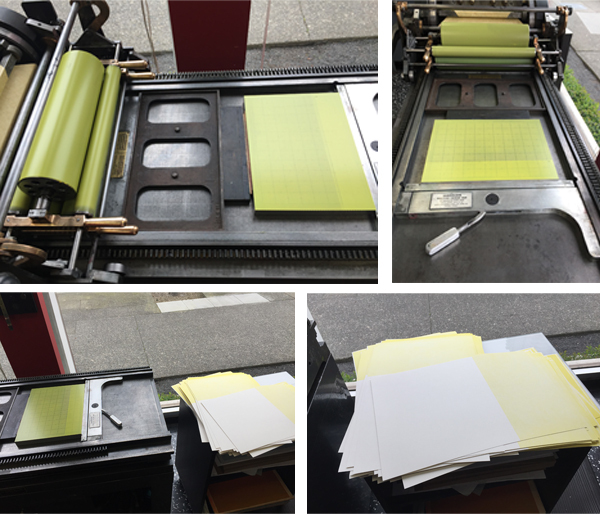 I printed a red-to-mustard-yellow pass (the color blocks behind the text blocks), and then turned the paper 90 degrees to print a blue-to-olive-green pass (the highlight colors in the frame). Unfortunately, in trimming the paper to permit it to fit on the press, I unthinkingly cut off my gripper edge. So when I went to print the polymer frame, I couldn’t. I quickly went through a list or three or four options for solving my disaster, and decided the least bad solution was to cut the polymer plate in half. The problem was compounded when printing the second half of the plate, when my favorite press inexplicably fish-tailed my paper a different direction on every pass, making close registration virtually impossible. I cried almost the entire run, convinced the broadside was ruined. 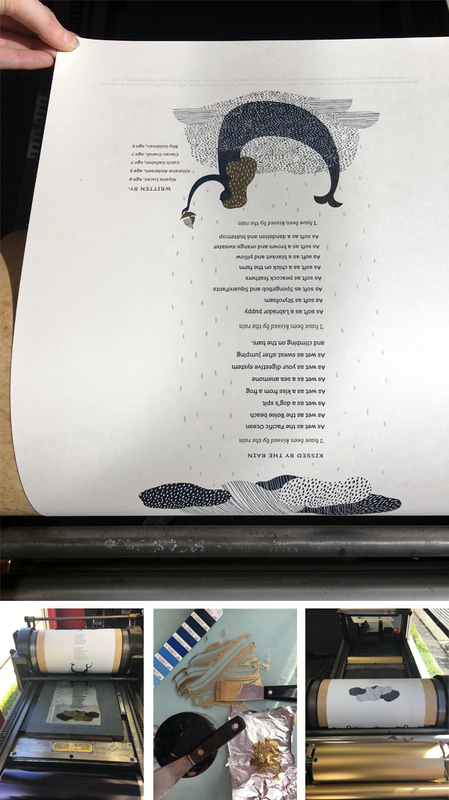 But I finished the project, hand-setting the poem and colophon in Bodoni and printing it without a hiccup. And it didn’t look too bad, in the final analysis. Five passes through the press. I never met Nandi, but I met her mom, Adele. Nandi was camping with Dad the week we met. We chatted for nearly an hour about Nandi’s poems and how her health crisis brought out Nandi’s strong spirit. I saw the connection between Adele and Nandi, and saw photos of the little girl and the big bunny. I wanted to bring out in my design Nandi’s playful, vibrant personality, and her love for her mother. I used two other techniques: hand-set metal type; and pressure printing. I wanted soft edges to the color blocks behind the stanzas of Nandi’s poem, so I used the back side of a Boxcar Press base (with the swirly pattern of the grinder as a design element) and a paper pressure “plate.” I did the same thing with the color highlights in the frame. I like the contrast between the crisp polymer printing and the softer pressure-printed colors. And I like the way the metal type echoes the sharp edges of the polymer plate. This is another of those projects that turns out better than expected, with different parts contributing to a unified whole. Heidi Hespelt As always, it was a privilege to illustrate one of these wonderful poems by these talented children. 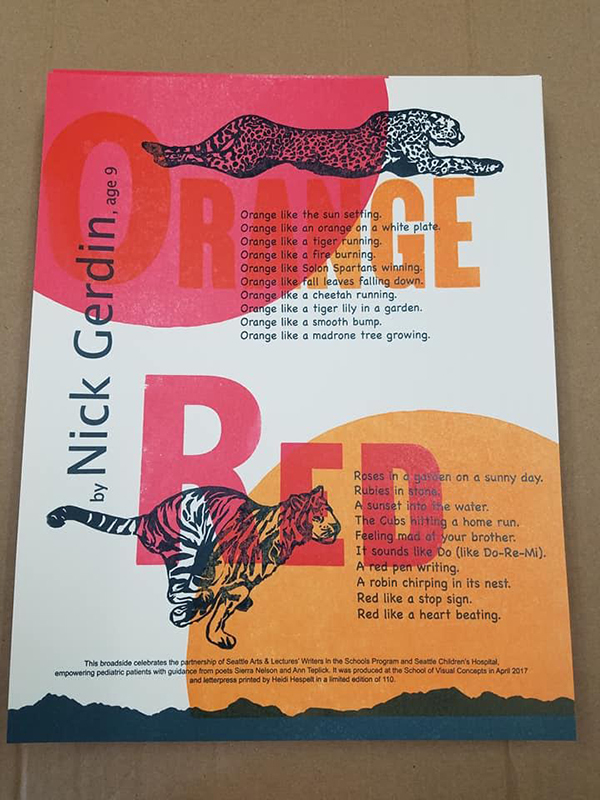 My poet was Nick Gerdin, age 9 and he wrote 2 poems, titled Orange and Red. His plan is to continue the series by writing poems about other colors of the rainbow. I love the word pictures that Nick painted. He is obviously an insightful guy. I used several different methods to bring my illustration to life. 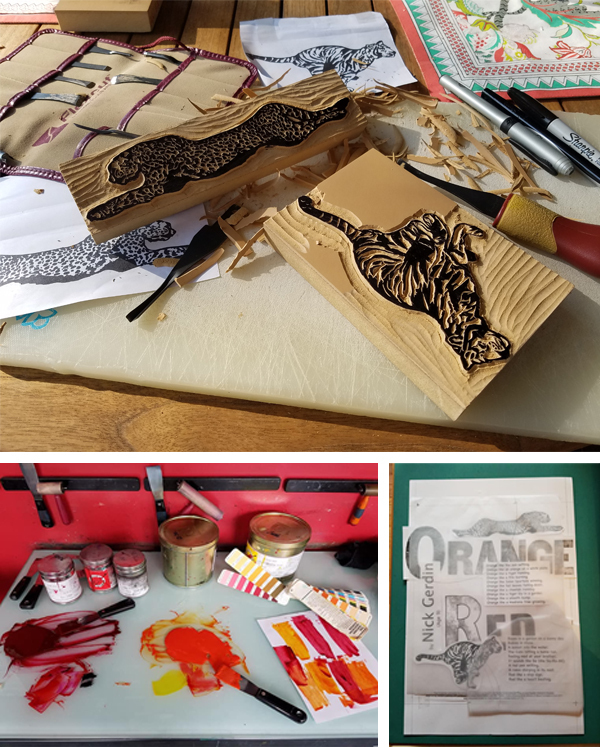 The titles, Red and Orange, are done in large antique wood type, the rest of the type is polymer from Boxcar Press (thanks, Boxcar, for your support! 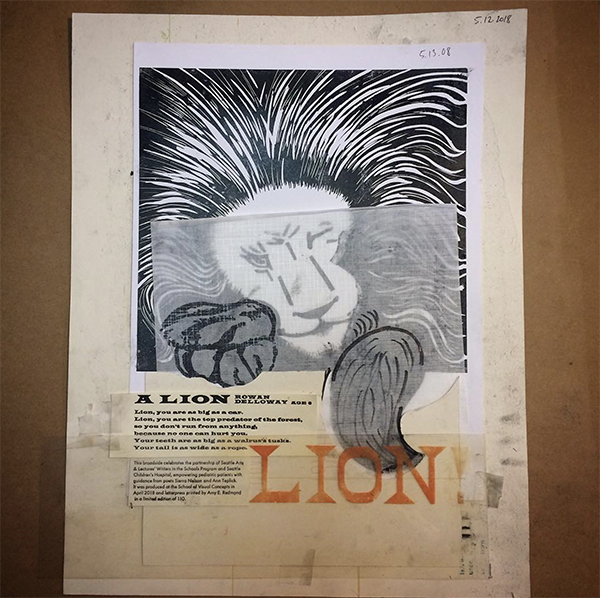 ), and I carved the tiger, the cheetah on lino blocks using photographs as inspiration. The setting suns and the bottom border are also carved from lino blocks. 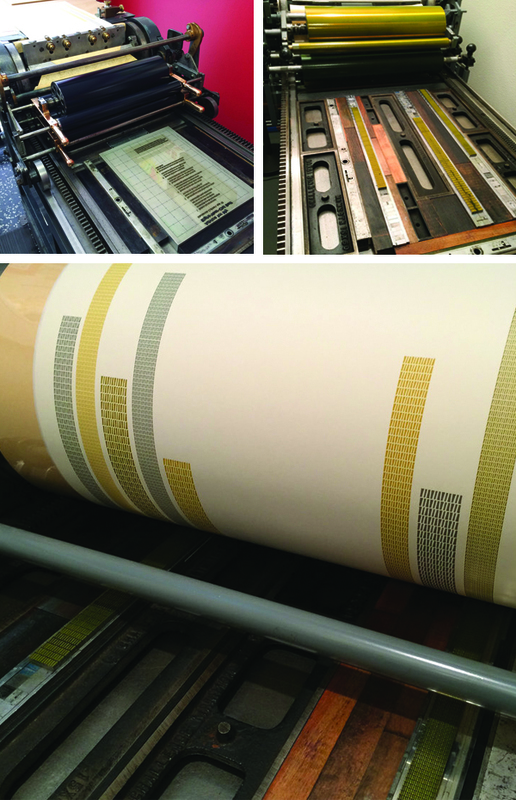 All of the printing was done on a Vandercook press at the School of Visual Concepts in Seattle. 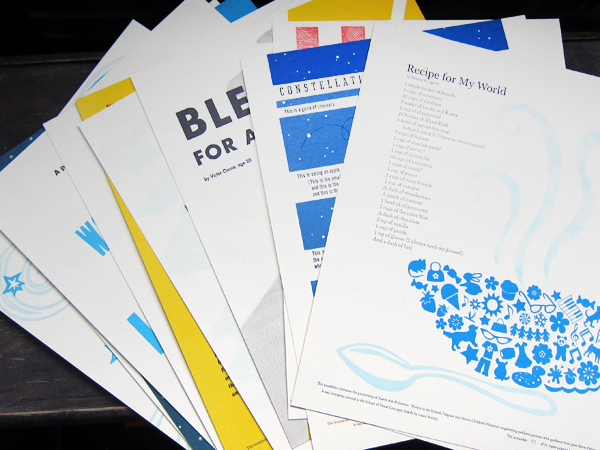 Much of the joy of participating in the Children’s Hospital Broadside project each year (this is my fourth year!) is the camaraderie between the printers and the creative way each printer (artist) interprets the poem that they are given. I like to think that our efforts will live long lives on the walls and in the portfolios of the poets and their families, and that our artistic visions will add a dimension to the poems that brings out a deeper meaning. 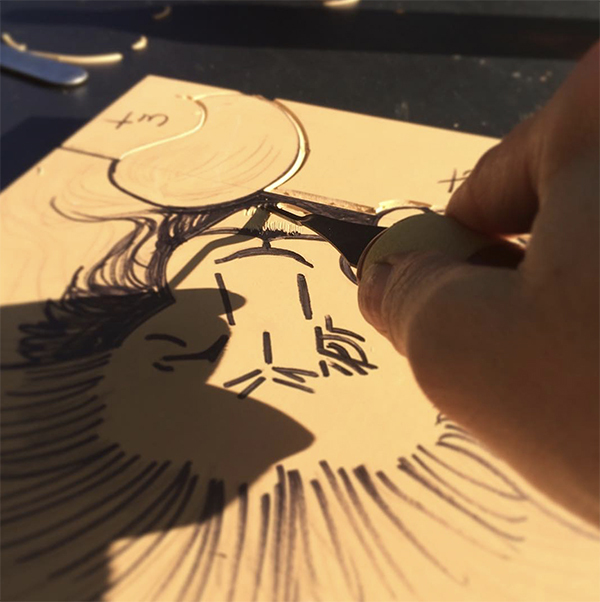 Sukhie Patel I love carving linoleum and engraving wood, so I knew I wanted to draw and then hand-carve the poem’s illustrations. Carving is, for me, a form of meditation, and it was a beautiful way to contemplate this young poet’s life and honor her through that process. It was hard to narrow down what to illustrate, as the poem had so many vibrant images to choose from. 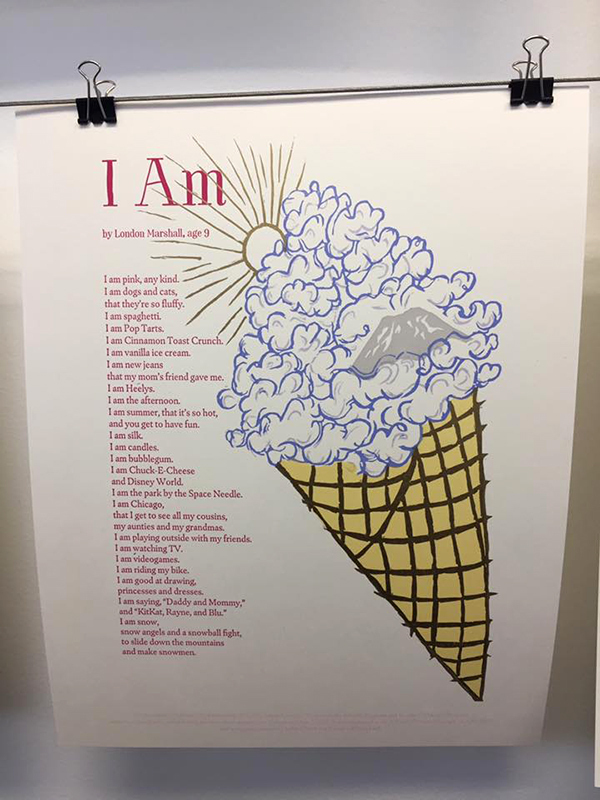 I wanted the broadside to capture as much of the visual levity and sweetness of the poem as possible, so I chose to carve this metallic gold ice cream cone of whimsical pastel cotton-candy-esque clouds, with Mount Rainier popping out amidst them. It ended up being 6 separate blocks, and including text, 8 passes. I found out two days after receiving the poem that the lovely young poet, London Marshall, had passed away at age 9. My approach thus shifted from designing a broadside to delight a 9-year-old audience, to designing a commemorative broadside for her family. I wanted to create something the family would want to return to at different stages in their grieving, that did not preclude a path of healing, and could bring them a smile. I hoped the illustrations would capture the levity of being nine years old, the vivacity of being a young girl, the earnestness of feeling in love with the world around her. It was an honor to print London’s poem, and spend time with her words. 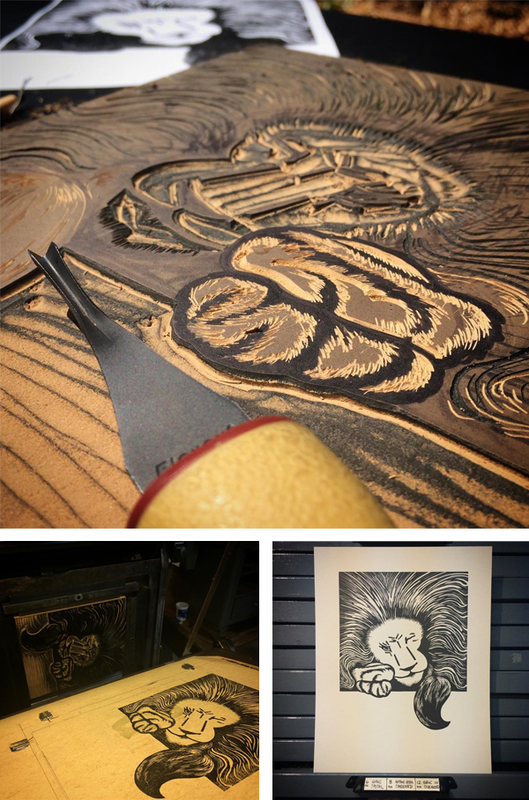 My print consisted of 6 hand carved linoleum blocks and two photopolymer plates. I don’t know how I would have pulled this off without the help of Boxcar. 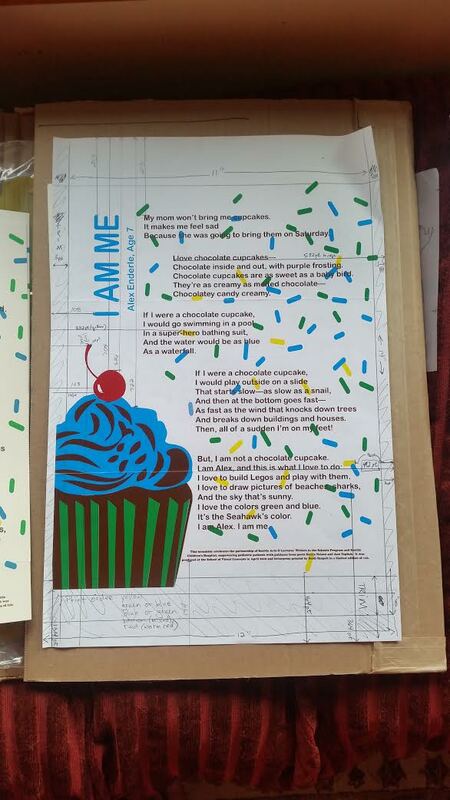 I had never printed with photopolymer before, but with the structure of this poem (each line began with “I am”), I didn’t have any cases of metal type with enough capital I’s! Incorporating photopolymer also allowed me to select a more contemporary and youthful typeface. It was such a pleasure working with Boxcar on this project, and (despite being a sucker for handset type) I can’t wait to incorporate photopolymer in more of my designs. It really did open up my eyes to a whole new set of techniques and approaches. Stay tuned & read on about this amazing Broadside project in the upcoming Part 2. 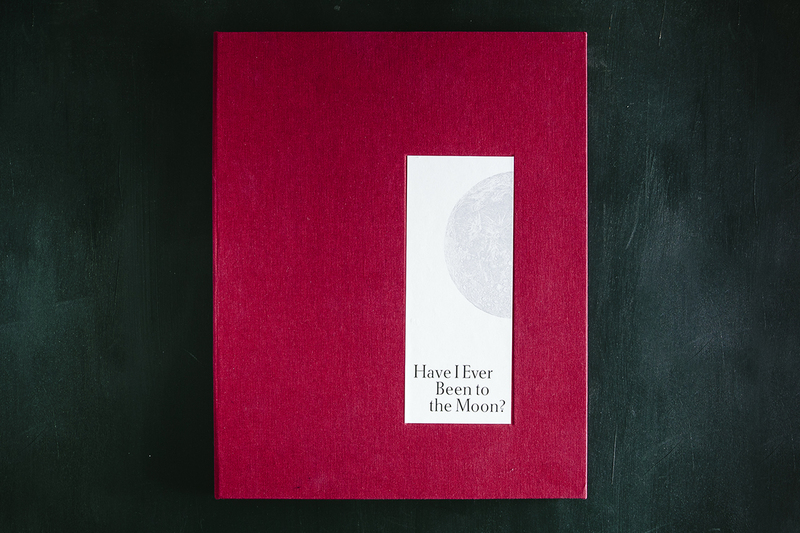 The ever-inspiring work of both poets and printers and the brilliant results are why Boxcar has a big soft spot for such an amazing tradition year after year. 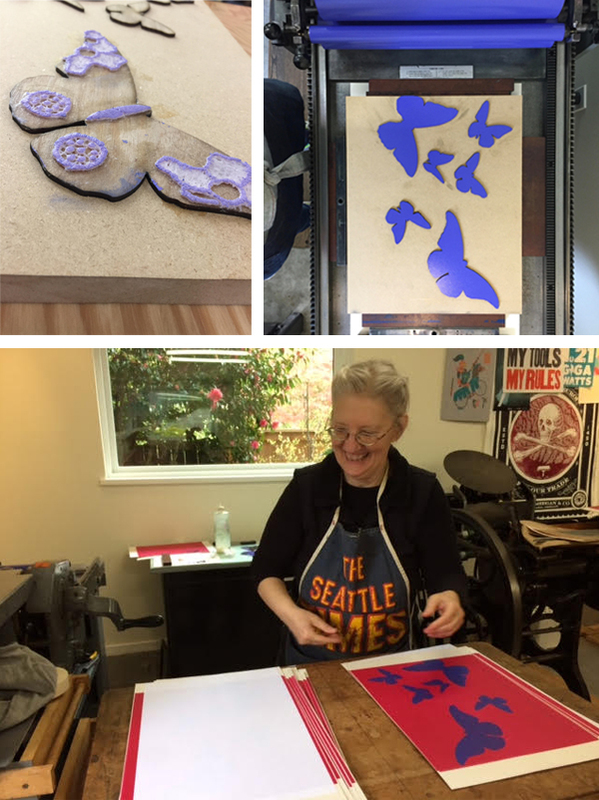 Part two in our blog feature of the 2016 Seattle Children’s Hospital Broadside project features six more artistic printers and young poets as part of the collaboration between Writers in the Schools program, long-term patients at Seattle Children’s Hospital, and the School of Visual Concepts in Seattle, Washington. These six printers share with us how they brought each writer’s words to vivid life in the 2016 edition. Nicole Cronin 2016 marked my fourth year participating in the Children’s Broadside Project. 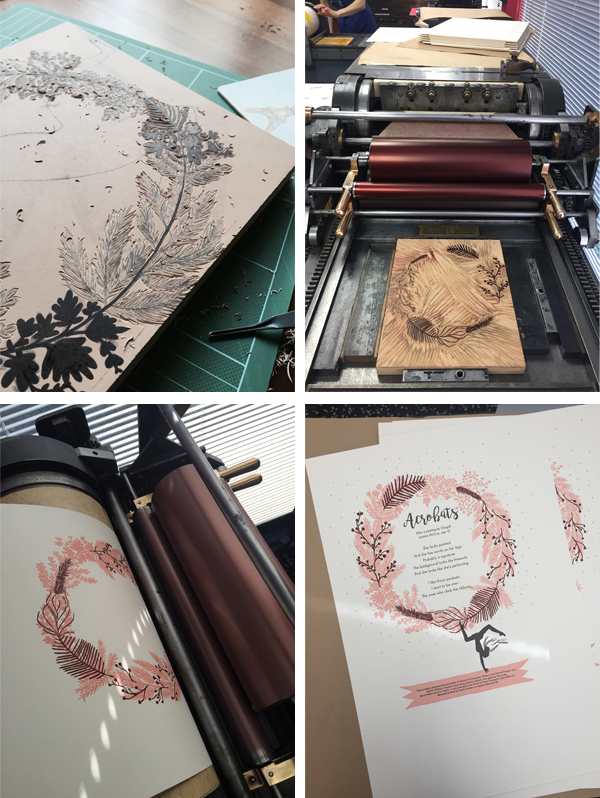 Each time, I am excited to create art for a good cause alongside my fellow printers! I was immediately drawn to Jasmine’s poem because of her detailed imagery and playfulness in her writing. 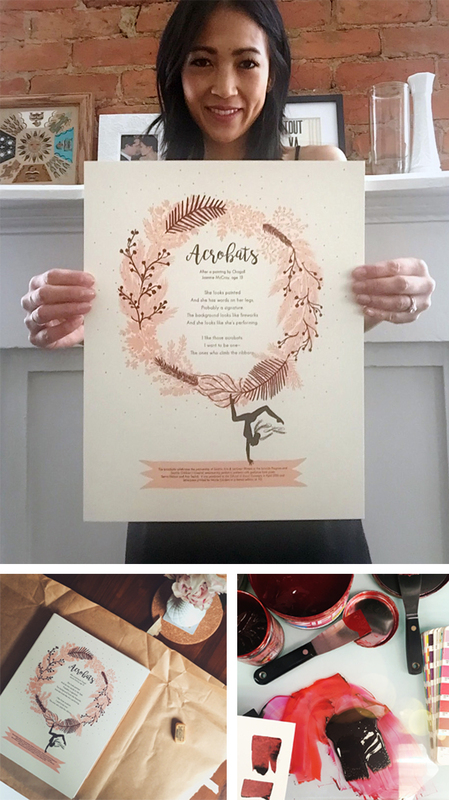 It felt whimsical and fancy and hopeful… so I wanted my broadside to depict her words so the reader felt like they were right there, watching acrobats performing and climbing ribbons! One of my favorite things in designing for letterpress is linoleum carving, so I decided to carve a hand drawn wreath and the pink ribbon. The most time consuming and also enjoyable part of the process was carving and printing the wreath. It was challenging to line up the acrobat between the ribbon and the wreath (which in hindsight sounds crazy, but so true). 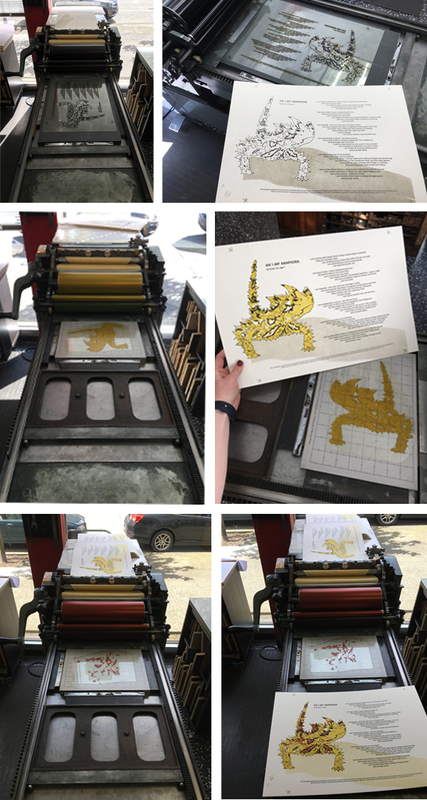 I printed the poem, acrobat and gold dots using Boxcar Plates which produced the most consistent passes on press. 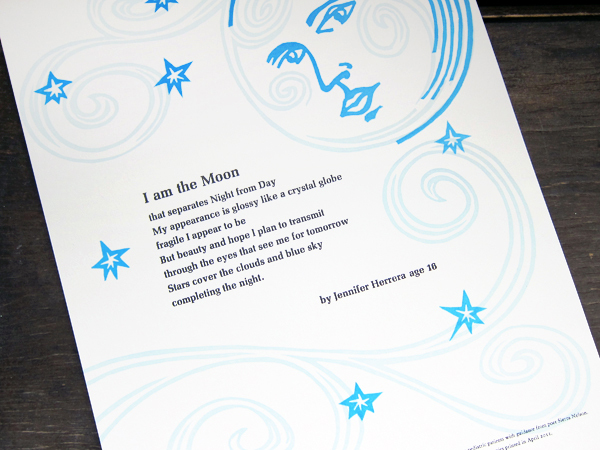 This project is personally fulfilling, and I am honored to have had the opportunity to design and print Jasmine’s poem. With great leadership by Jenny Wilkson at SVC, we have a strong team that provides time, paper, plates, etc. and I am so grateful to have contributed a small part. Carol Clifford This will be my 7th year of working on the Children’s Hospital Poetry Broadside Project. Each year we are presented with poems from the children to read over and consider. Then we all meet as a group and each chooses a final poem to interpret and print for the young poets. I usually sit down with a cup of coffee and take time to read each child’s poem. Then I reread. Many of these kids are heartbreakingly wise beyond their years. I will connect with some of the poems more than others. A few suggest ideas and images fairly quickly. I usually draw thumbnails right away in the margins, percolating on others until we meet to get our final assignment. I chose Two Constellation Poems by Matthew Whitesel because I liked that this was one of his first attempts at a poem, and it turned out so visually rich and funny. 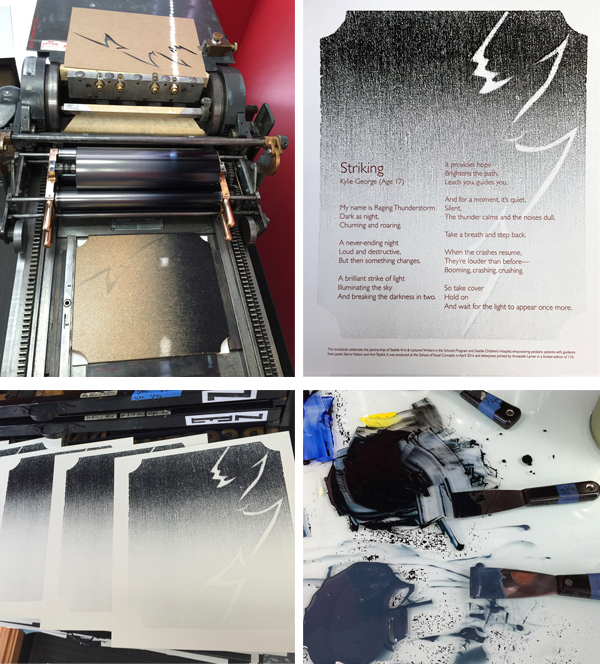 I liked the challenge of creating a dark field of color with letterpress printing. As a bonus, I just happened to have a unicorn image I had recently used for another project. Because of the line “Why he has a pet unicorn, I have no idea,” I knew I wanted the unicorn to be front and center and gold (Right?! I used MS-1151 Rich Gold Paste from Hanco Ink Co) Printing gold as the featured color directed building up the background. With experimentation and suggestions from other printers, I learned that highlighting the shine quality of the gold ink is more successful when printed over another color, especially a darker color. To form the dark background, I was inspired to use two colors that overlap and create another color with a lot of depth. 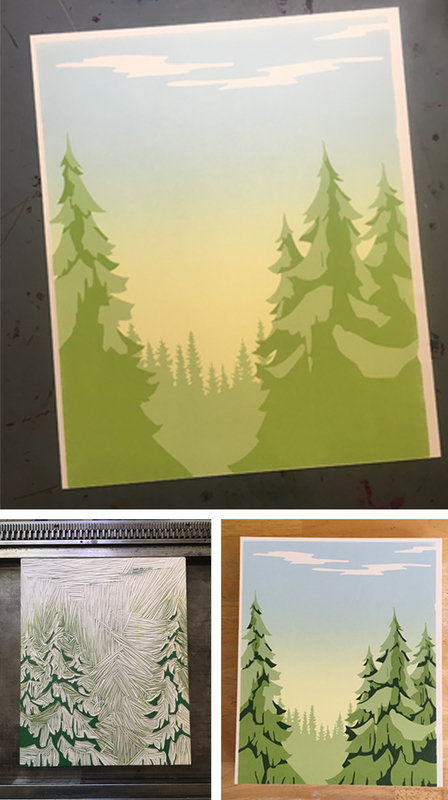 I try to work out all the steps of a broadside before going on press, but inevitably, once I am in the studio, I tend to combine techniques to accomplish my ideas. This method of working can be maddening, but also allows for a lot spontaneity and, fingers crossed, happy surprises. 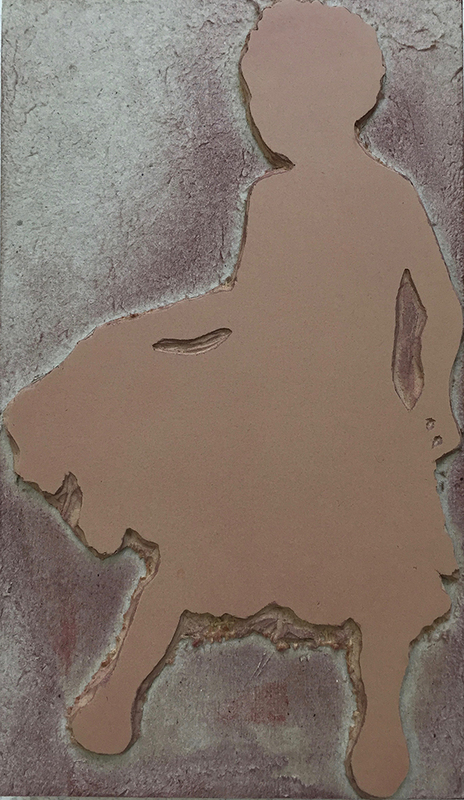 The image was created with a combination of linoleum blocks and polymer plates. I had planned for a four color run. It turned out to be nine! Two runs of red to get the saturation and color I wanted, 4 runs of gold to solve registration woes and for clarity on the colophon and then black and blue runs with linoleum blocks. I am really pleased with the final result. When I come up with ideas for the broadsides I keep in mind the age of the poet. Ultimately though, my hope is that the piece will not be too “childish” and that the broadside will give both the poet and his family moments to enjoy for years to come. I haven’t met Matthew but I was told that his younger brother thought it was really cool to have something he wrote printed. This experience has inspired both of them to write more. Leah Stevenson The Seattle Children’s Hospital Broadside project was a fantastic and challenging experience. I was equally excited and nervous to be a part of the collaboration. It was my first time and I wanted to ‘get it right’. These kids go through so much and being able to create a piece of art with them felt special and so important, even more so because we knew some of the kids wouldn’t and didn’t make it to the end of the project . I unfortunately never got the chance to interact directly with the kids but just hearing their stories through the poetry was extremely powerful. This was not just a piece of artwork that we were creating but also a piece that represented these kids in a way that a lot of people don’t get to see. I selected poetry by a young student of 6 years who had four short poems together, each in English and Spanish for a total of 8 pieces of text to work with. Having grown up in South America, I felt an instant connection to the poet through her use of Spanish & English in her writing. It was a challenge to figure out how to piece all these separate poems into one cohesive broadside. I had recently visited L’Opéra de Paris (the Paris Opera House) and was inspired by the mural on the ceiling for this piece as it depicted various scenes from different operas all together. I decided to take that concept and separate the poems into four sections surrounding the sun in the middle. This gave each poem it’s own stage, so to speak, while still tying them together. I used a combination of pressure printing and photopolymer plates on this broadside. I used pressure printing for some of the background colors, as I wanted a little more fuzziness around the edges – not so clean and precise. To contrast, I used photopolymer for its clean lines for the more details work as well as the text. I actually hand wrote the poet’s name, age and title of the piece and digitized that to create a photopolymer plate. It felt like it gave a different emphasis on the poet that paired nicely with the illustrations around it. I had a lot of registration going on in this piece, which proved challenging to control with the larger run. I had at least 8 passes and getting everything to line up was tough (and in some cases impossible) but it was definitely a learning and enriching experience and worth every minute I spent on it. Jill Labieniec This year I worked on the group poem which combined words and ideas from different children. It was challenging to include all the imagery from the poem so I opted to add my own idea into the mix. The overall theme was kissed by the rain so I figured a mermaid who lived in a puddle would be very appreciative of a little rain. Amy Redmond I am a Seattle-based visual designer, a letterpress instructor at the School of Visual Concepts and letterpress printer since 1998. I work with photopolymer but absolutely fell in love with handset type. For personal work and special projects like the Seattle Children’s Hospital Broadside project I work only in handset type. The focus it requires, and the time, is my way of paying my respects to both the poet and the poem. I become fully immersed in the words and the process, and the extra time it takes is worth it. The poems the children write represent a huge amount of energy and heart on their part; it’s only fair that I attempt to meet them on equal ground. This is my 6th time as a contributor. 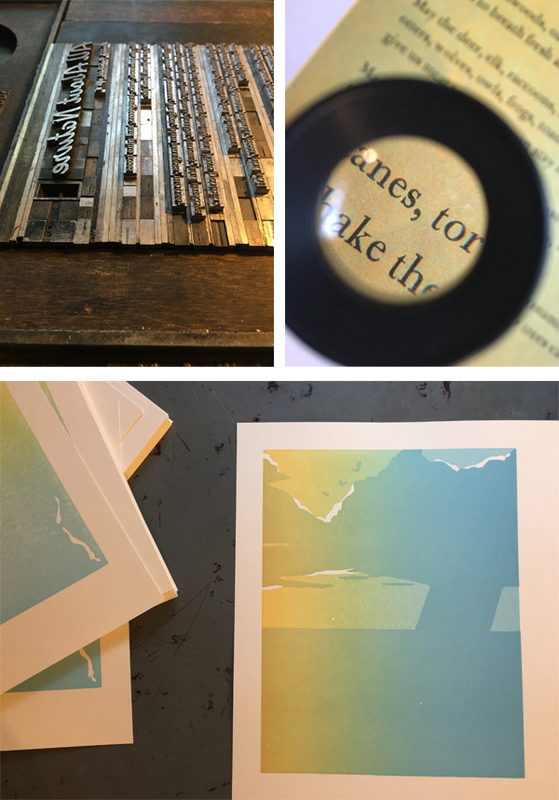 I do it for several reasons: to bring the poems into light, to be a part of a larger community project, to challenge myself, to learn from my mentors, to work side by side with the Seattle letterpress community. It is a very closely connected group and this Broadside project is one of the ways we maintain that association. The artistic work on this project gets better each year. We all work hard to out-do ourselves, and put to use new tricks we’ve learned throughout the year. 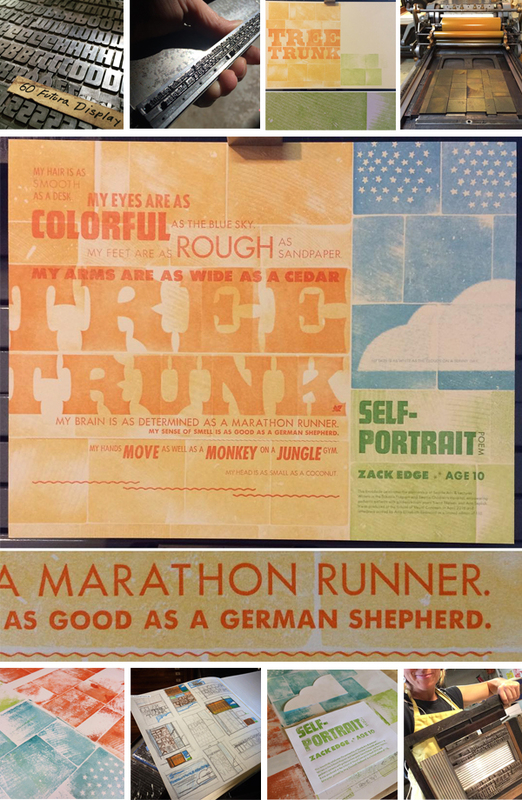 We learn from each other to push the traditional boundaries of broadside design. My poet, Zack Edge, incorporated a lot of imagery into his poem. I used large wood type (front and back) to help create a landscape in which his words would live. On the left the orange words form a wide tree trunk; on the right a sky and a field are formed. 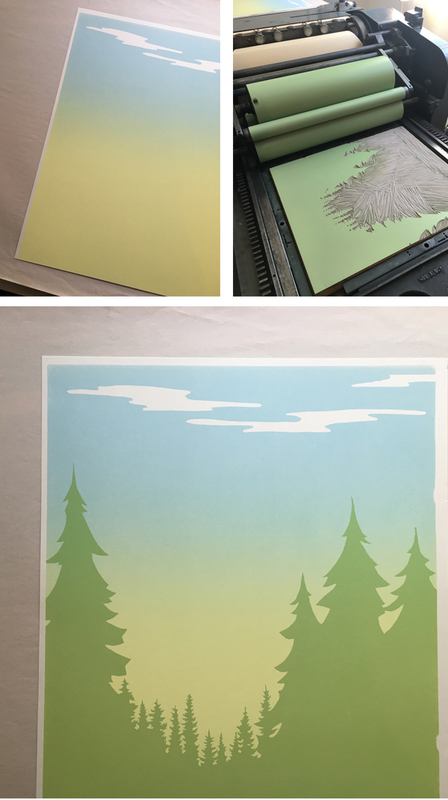 I used pressure printing techniques to create the white cloud when printing the blue sky, and it was serendipity that the wood type I chose happened to have a few stars carved out of from its backside. For the smaller type, I handset everything in metal type – Spartan – on a 1903 Colt’s Armory Press. With all the various weights I was able to play with the cadence of the type, and pushed — as far as I felt comfortable — the composition of the poem itself. By placing the last line of the poem to the far right in the cloud and having it stand alone, I hope to give it emphasis so that others also take note of its gravity. Laura Bentley I received a reflective and powerful poem by a 16-year old named Mackenzie who worked with poet Ann Teplick. I was struck by the earthquake imagery in the poem. It made me think I could do something with shifting plates of earth or seismographs. After weighing several options I was excited about the thought of using metal type ornaments that look a bit like layers of earth and thought I could put something together that imitated seismic faults, albeit in an abstract way. The bars of ornaments can also reflect just the abrupt ups and downs that life can take. Thank you Mackenzie, it was an honor to print your words. For colors and typeface I was leaning towards both “earthy” and “mid-century modern, particularly, a typeface from the age of printing with metal, even if I would be printing it with photopolymer. The metal type ornaments were set to the correct lengths, and arranged in position in the press bed. 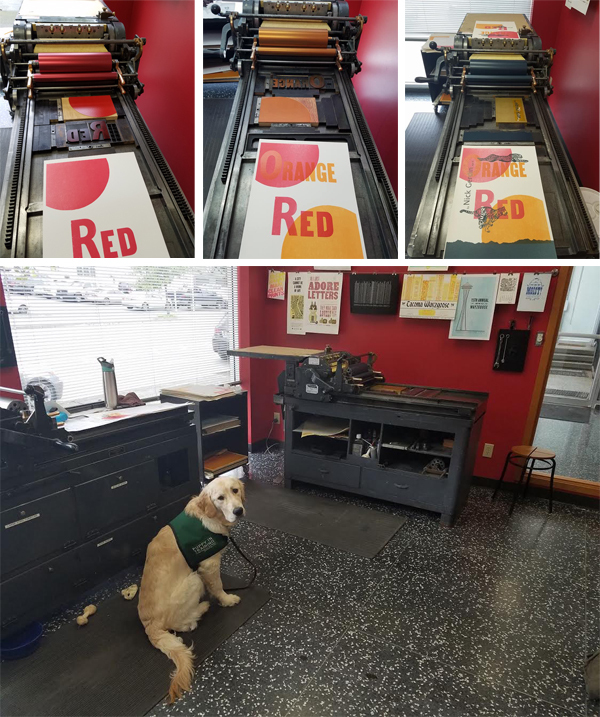 Each color is printed in a separate pass through the press. For an edition of 110, I started with 120 pieces of paper. For those of you counting that meant that 120 pieces of paper through the press four times meant feeding paper through the press 480 times! 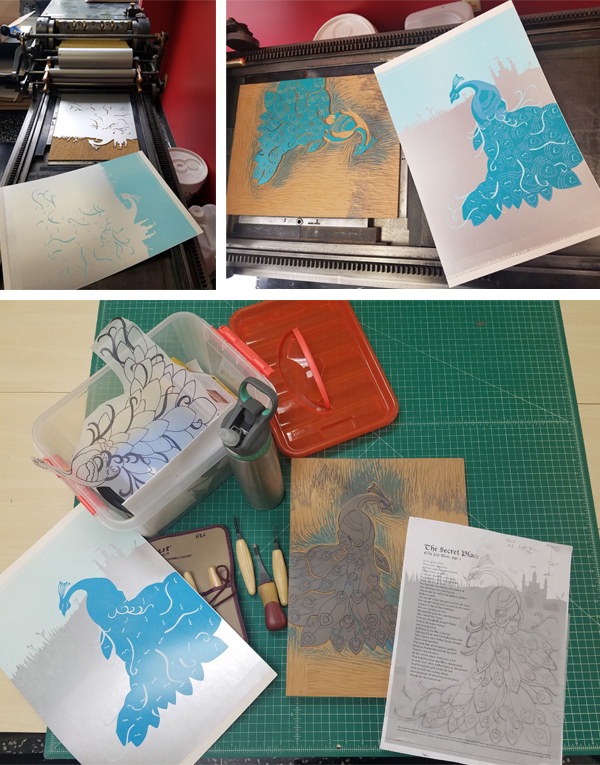 Laure’s full blog article covering her printing adventure can be found here. A huge round of applause and thanks out to all of the printers who donated their time and efforts to this amazing project! 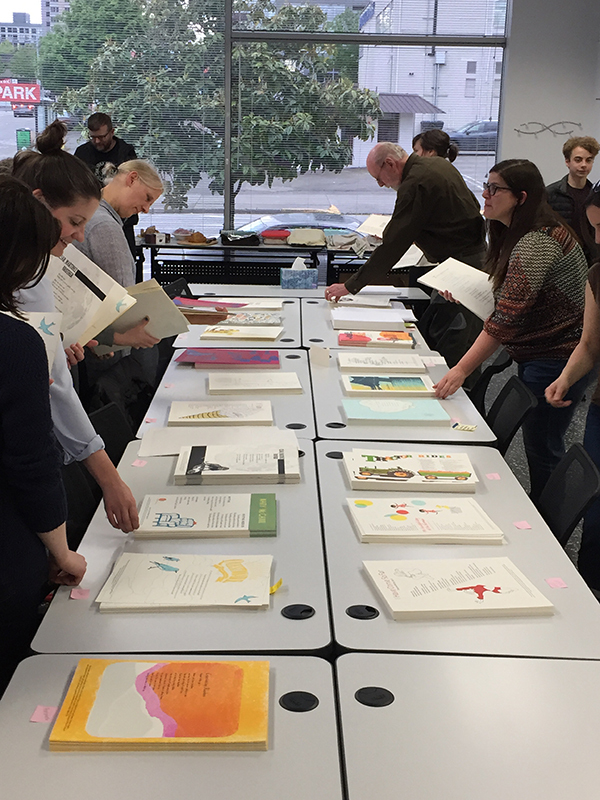 In its sixth year of running, we’ve teamed up with amazing young poets, and inspired printers to share with you 2016’s Seattle Children’s Hospital Broadside project in a two-part blog feature. 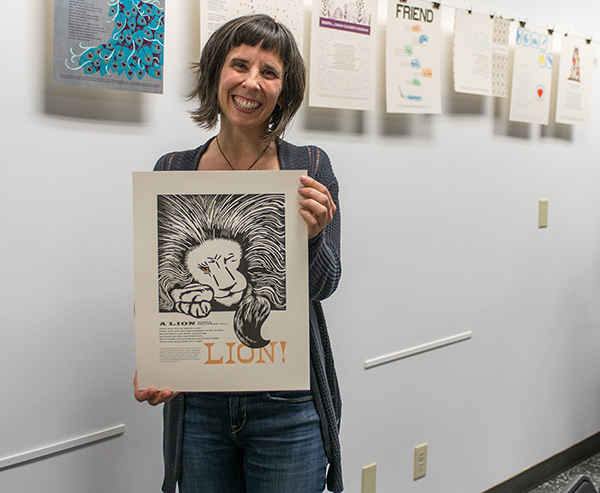 The collaboration of 22 artists and pediatric patients is helmed by poets Sierra Nelson and Ann Teplick of the Writers in the Schools program and the School of Visual Concepts in Seattle. 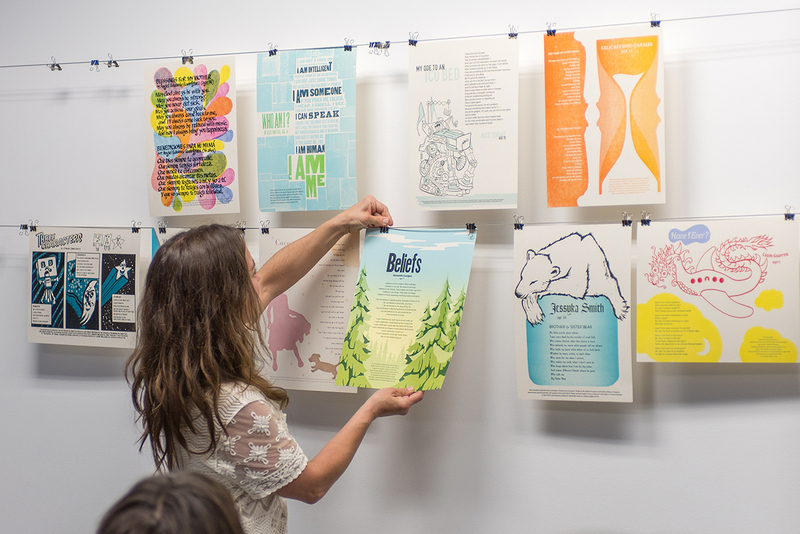 WITS works with long term patients at Seattle Children’s Hospital to write poetry, out of which printers & artists create beautiful letterpress broadside prints. 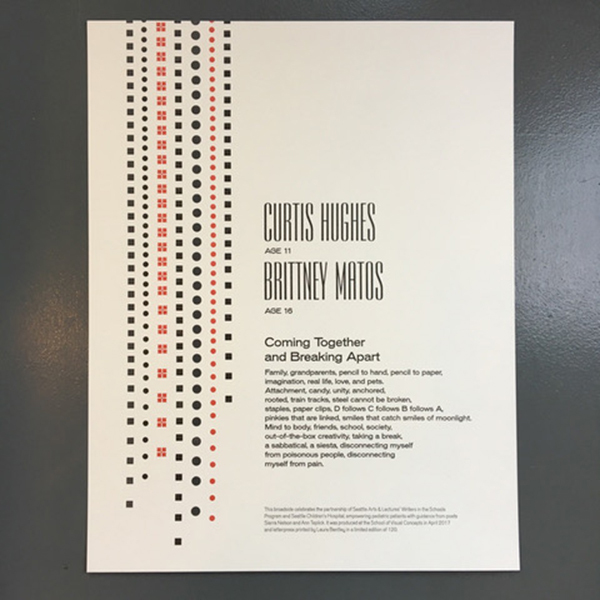 Boxcar Press supports this project with photopolymer plates for the limited run of broadsides. Participating printers share their experiences bringing each poet’s words to life in this year’s edition. This first installment features six printers who share their printing process and experiences with the youth writers of the program. Bonnie Thompson Norman Every year, I feel a strong connection to the young person whose poem I print. I know each person who works on these broadsides feels the same way. We don’t always have (or choose to have) the opportunity and/or privilege of meeting our poets, but the bond is a strong one. As the project comes to an end, we all gather for a potluck dinner. All of the completed broadsides for that year’s project are displayed. Each of us reads “our” poem and talks about the process of creating the image, designing the text, printing, etc. The sharing that takes place as we read and talk about our connection to the young person who wrote the poem and our experience in interpreting it for others to see, is a meaningful bond for all of us and each of us…to the writers, the poets who work with them, and one another. It is what keeps us looking forward to coming back year after year. It isn’t just a legacy for the poets and their families. It is our legacy, too. One last comment on the bond between printer and poet… last year, I wrote a blog post about my young poet who I was able to meet on his 17th birthday. He teared up when he saw how I had interpreted his writing. We met at the Children’s Hospital where he was (again) a patient when I gave him his copy of his poem that I designed and printed. We were both emotional when he saw how I had interpreted his writing. It was so gratifying to see how he appreciated what I felt was our collaboration though we had not met before. Chris Copley 2016 was my second experience with the Seattle Children’s Hospital poetry broadside project. 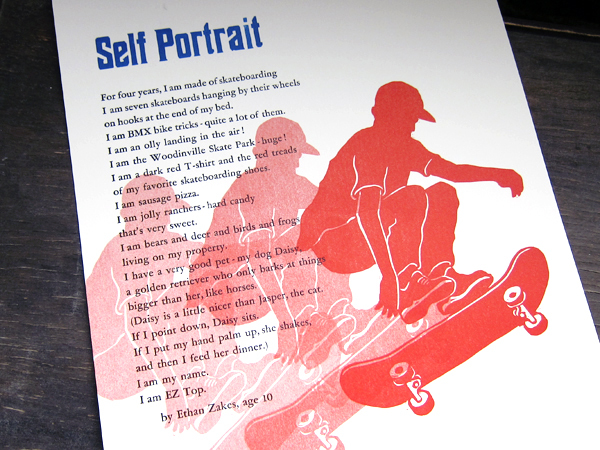 My 2015 project was both artistically challenging (still a rookie to letterpress, I carved three 10-inch-by-13-inch linoleum blocks to illustrate the poem’s text and images) and emotionally poignant (the poet I worked with, 13-year-old Ahmie Njie, died about a month after I printed her poem). Exchanging a few Facebook IMs with her before she passed away remains one of the highlights of my life. I liked the idea of incorporating the text of the poem itself in the illustration of the poem, so I planned to do that again in 2016. I worked with a poem by 12-year-old Kayli Jones, a Chinese-born adoptee living with her American parents and three brothers in Idaho. I exchanged a few email questions with the poet’s mom to learn a little more about the poet. The primary design concept for me revolved around Kayli’s Chinese origins. So I decided to use the poem’s text to represent branches of a Chinese-style cherry tree in bloom. Cherry blossoms are considered a symbol of good luck in Asia, and Kayli’s poem ends on a note of hope and determination to beat her cancer. I hand-drew the letters of the poem, then ordered a polymer plate from Boxcar. This was my first polymer plate print run, and it worked SO WELL. I couldn’t have been happier. All of my text was printed in black. I then hand-set a tall, thin column of text for the colophon; the form was intended to evoke the look of a column of characters on a Chinese-style painting. I decided to print the second color, red, using a different technique — pressure printing. I used a print from the first color run to cut out the cherry blossoms, and then glued them onto another print to create the pressure-print “plate.” I used the print with the blossom “holes” as a frisket to mask the speckling you get with pressure printing. Printing the blossoms also went pretty smoothly, although I had to recut the frisket twice to try to get the blossoms the way I wanted. Finally, I added another element, at least to some of the prints: several hand-drawn Chinese-style chops, also in red ink. Two of the chops spelled Kayli’s name in characters reminiscent of ancient Chinese text. I printed them freehand on only a few prints, using an ink-stamp pad because I worried they would distract from Kayli’s poem. I was really happy with the broadside design and printing, and I felt it represented Kayli well. As much as I enjoy the artistic and technical challenges of portraying a poem, it’s important to me to represent the person whose work I’m illustrating. 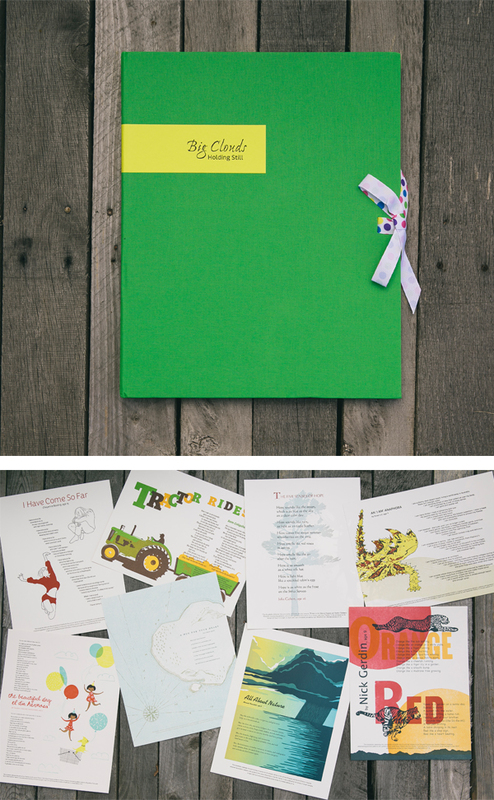 Darcie Kantor It was an honor to be part of the Children’s Hospital Broadside project. This was my second year participating. 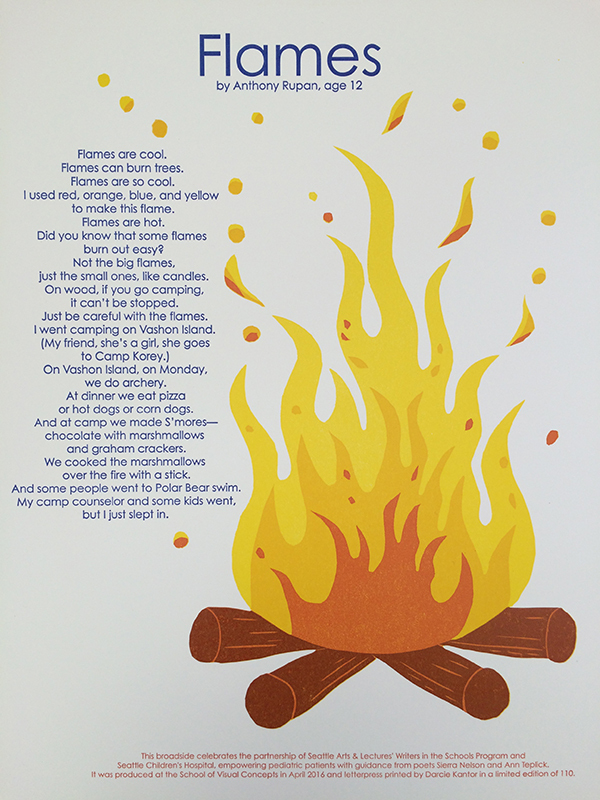 For my process I combined Boxcar plates for the poem and did a linoleum block reduction for the fire/flames. It was a fun project to work on. Juliet Shen The boy who wrote this poem was a registered member of the Swinomish tribe whose lands are north of Seattle on Puget Sound. I had designed a font for the Lushootseed language (indigenous to this area) and asked my contacts in the Tulalip Lushootseed Department to have his poem translated so it could be typeset in both languages. When it comes to making art work, I am against the appropriation of traditional Native American art styles by outsiders because my research for making the Lushootseed font revealed that the iconic imagery used by Northwest tribes has deep cultural significance. I decided to design to my particular strengths, which are typographic, not illustrative, so I typeset the poem in a shape that I hope looks like an elk to readers. I rely on polymer plates because my primary focus is on typographic design and I need the control that using polymer affords me. 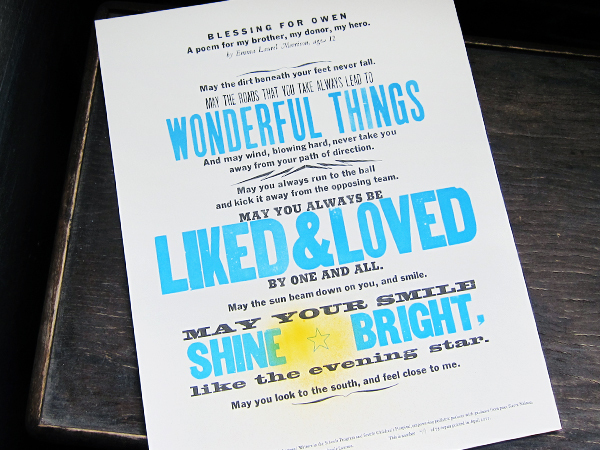 Heidi Hespelt I do want to say that our printing community is amazing! I had a terrible back injury at the end of last year and was pretty much out of printing commission. Amy Redmond offered to do the actual printing for me if I wanted to be involved in the design. She made it possible for me to participate by giving of her time and printing expertise. Project supervisor, Jenny Wilkson, selected a younger poet for me, not knowing that she chose what was secretly the one I wanted. Serendipity. 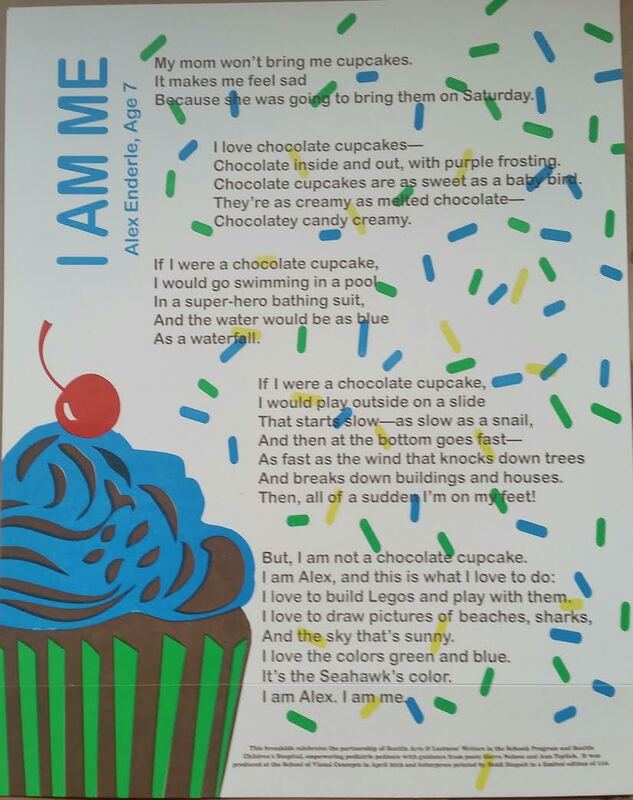 My poet was Alex Enderle, and the poem was “I Am Me”. Alex was 7 when he wrote the poem. I think of it as the cupcake poem. I wanted a younger poet because I have a now 5 year old grandson that is a big part of my life and felt like I could probably tune in to what a little guy might find interesting. Bright colors and yumminess that you can see seemed important and I loved what I was able to accomplish with Boxcar plates. Annabelle Larner I’ve participated as a printer in the Seattle Children’s Hospital Broadside project since its inception about 6 years ago. Most of my work is all hand done. 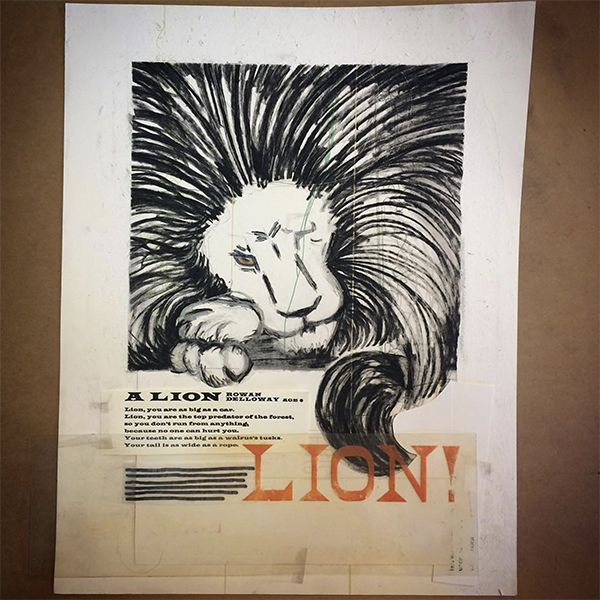 This year’s project, from April 2016, was printed using a hand-cut wood block as the printing base, with a lightning bolt used as a pressure print. 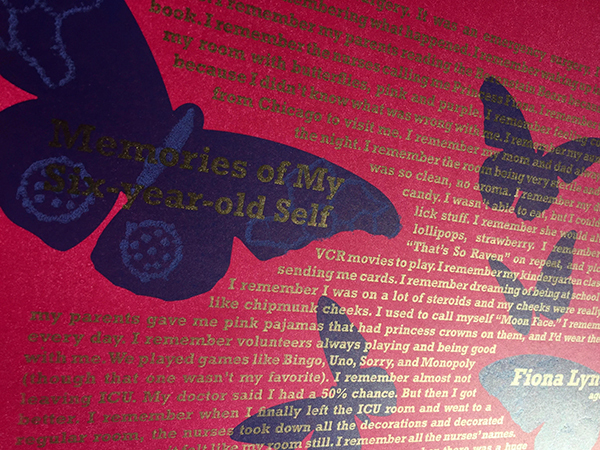 It was printed with a split fountain ink in dark blue, then the final polymer type was printed in red. Working on this project is extremely rewarding, and also hard. I want to really get into the words of the printer and try to convey their feelings in a way that is not too literal or childish, as I know kids can appreciate darkness, and what they are going through is pretty dark. Sometimes I get to meet the kids and it’s always special. Their parents are often very grateful, and seeing the kids talk about their poems is amazing. Stay tuned & read on about this amazing Broadside project in the upcoming Part 2. 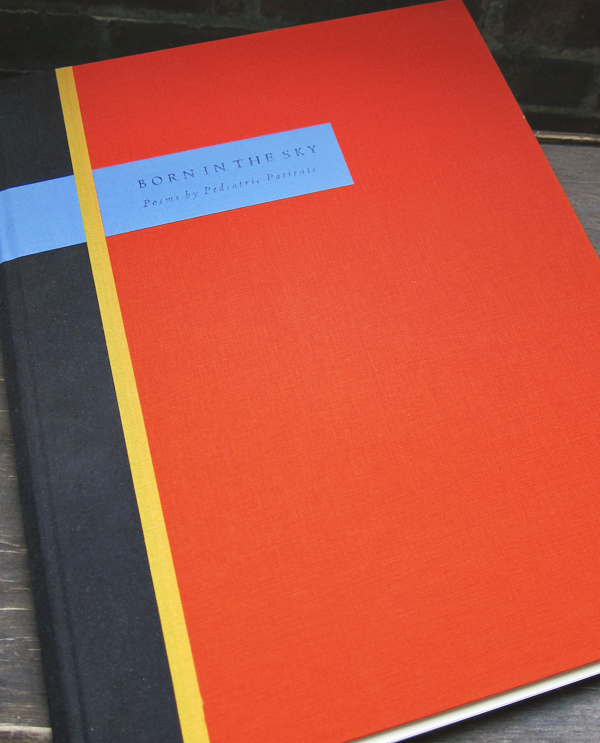 The creativity and intensity of both poets and printers and the dazzling results are why Boxcar is proud to have a part in this project every year. 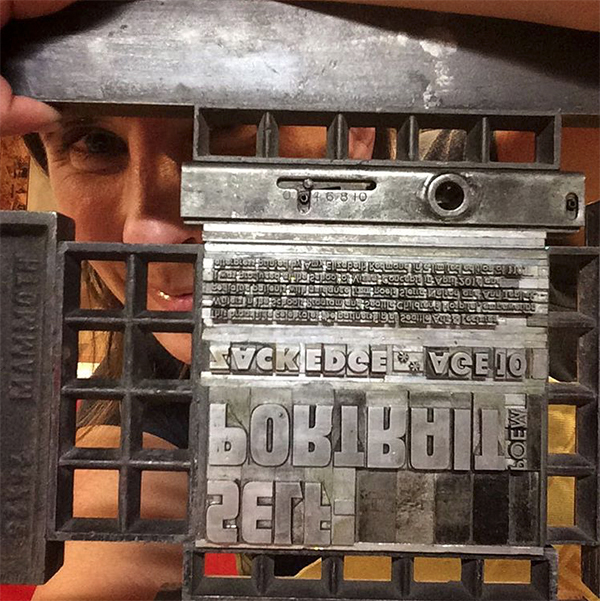 Here at Boxcar Press we love hearing stories of letterpress doing good! 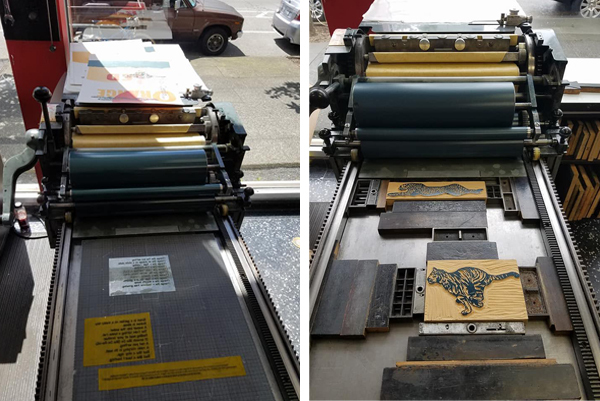 We were honored when asked to donate our photopolymer plates to a letterpress printing project headed by the School of Visual Concepts in Seattle. The School of Visual Concepts teamed up with Seattle Arts and Lectures through their Writers in the School’s program. 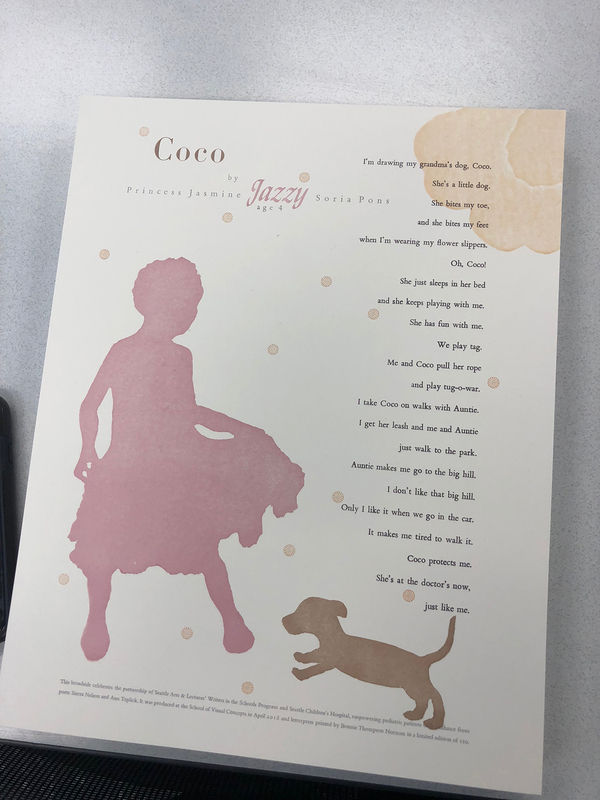 Working with a local children’s hospital they planned to create poetry broadsides with children who are terminally ill. We were privileged to be included and gladly donated our photopolymer plates. 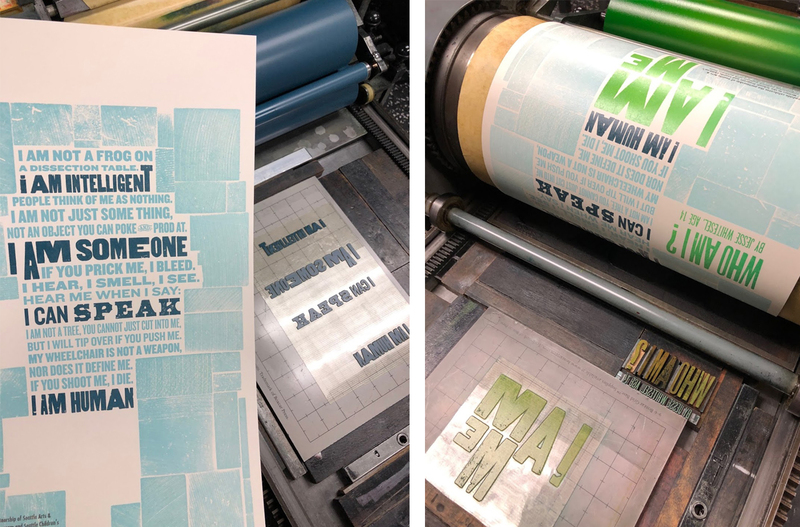 It’s an amazingly moving project (try reading over the poetry and keeping your eyes dry), and it reminds us of how cool the letterpress community is, and what great things we can all accomplish together. The children wrote poems as part of a legacy project. 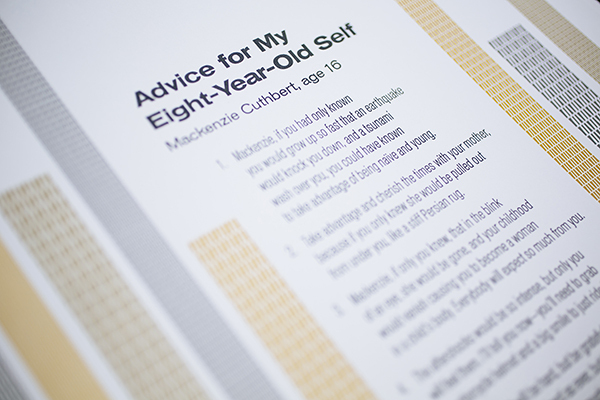 The poems were printed as letterpress broadsides and included in a portfolio. 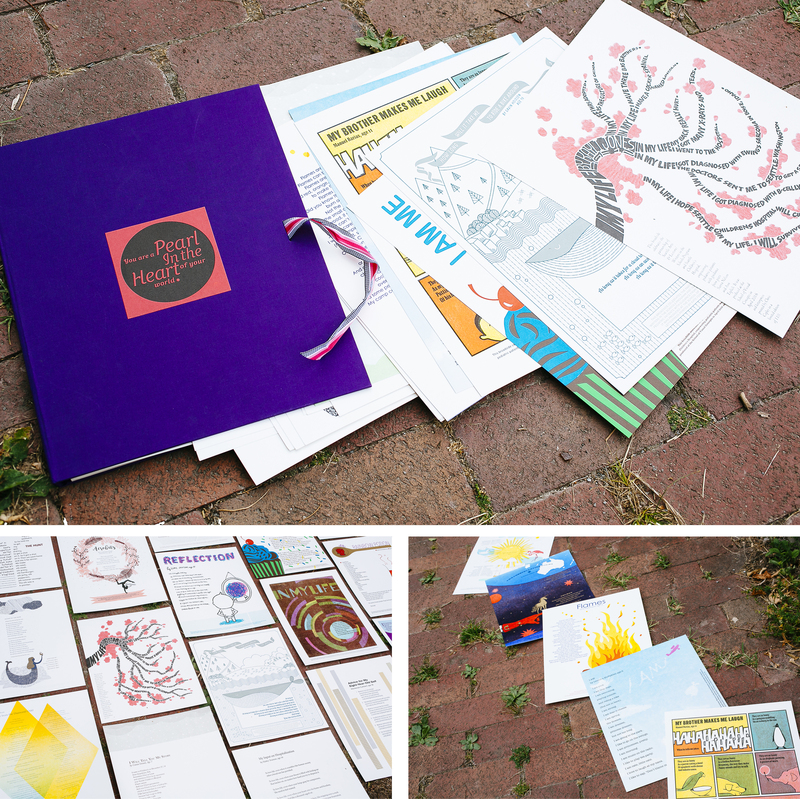 Everyone pitched in on this project, from 12 letterpress printers volunteering their time, Mohawk Papers donated the paper, and a book cloth company (Ecological Fibers) donated materials for creating the actual portfolio. Each child’s family will receive several copies and the others will be distributed to local children’s groups and hospitals to be auctioned off as a fundraiser. There is a limited edition of 75 on each. 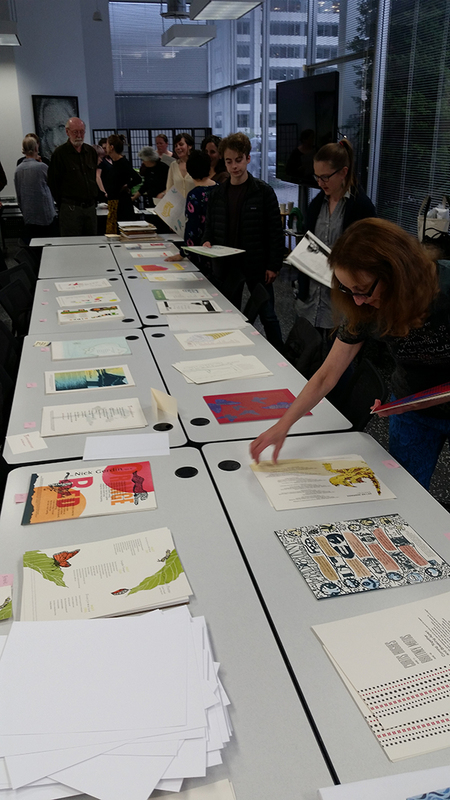 Many thanks to all who were involved: Seattle Arts & Lectures,Â Seattle Children’s Hospital, School of Visual Concepts, Mohawk Fine Papers, Puget Bindery, Ecological Fibers, Boxcar Press.